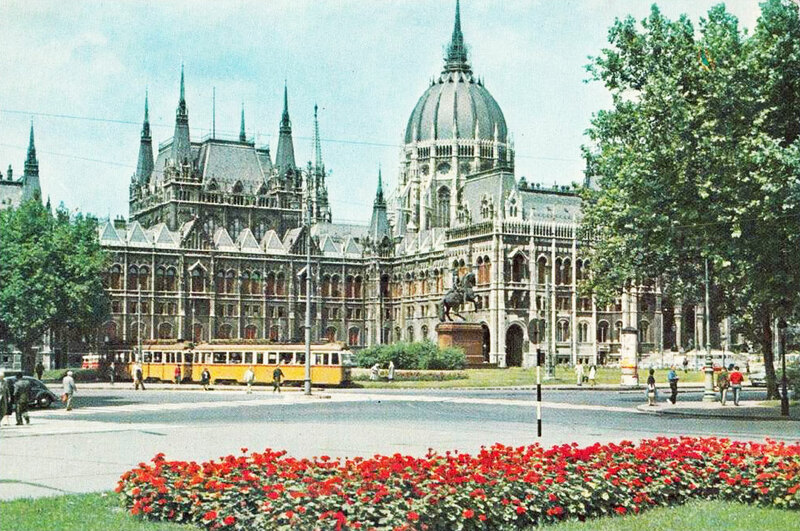 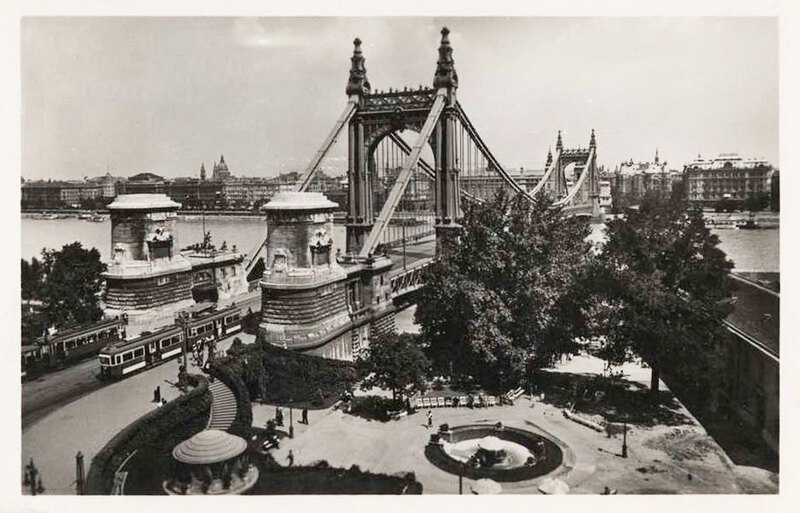 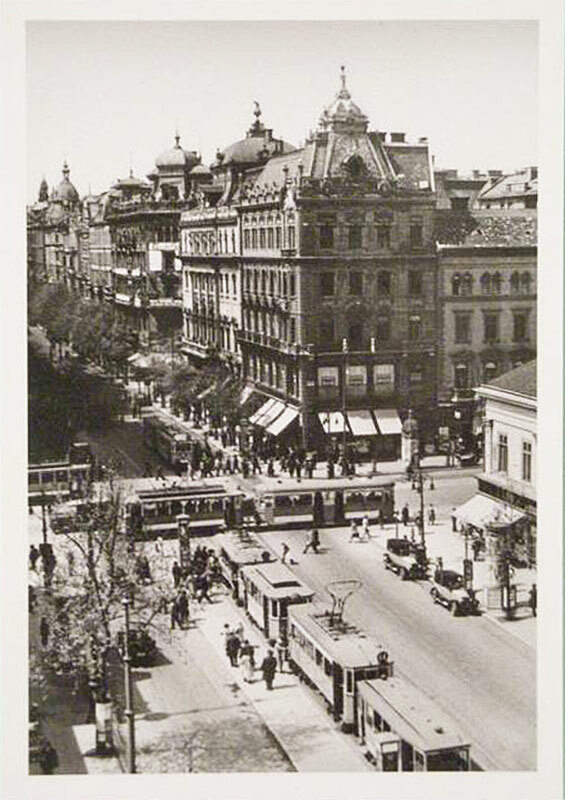 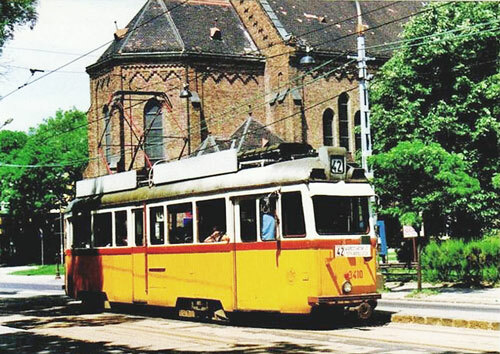 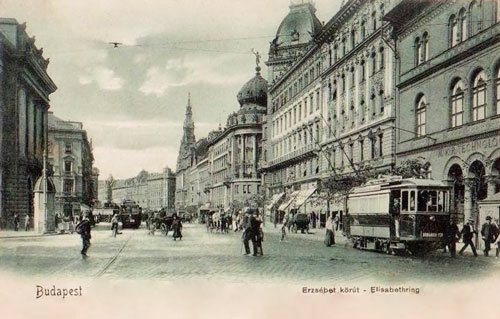 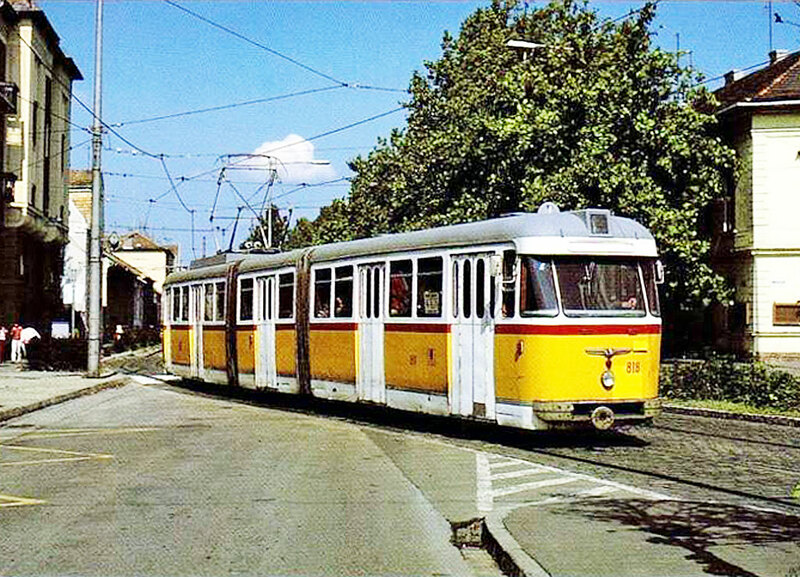 This page shows images of Budapest trams, taken by David Pennock & Michael Tedstone. Trolleybuses, railways and river boats will be added. 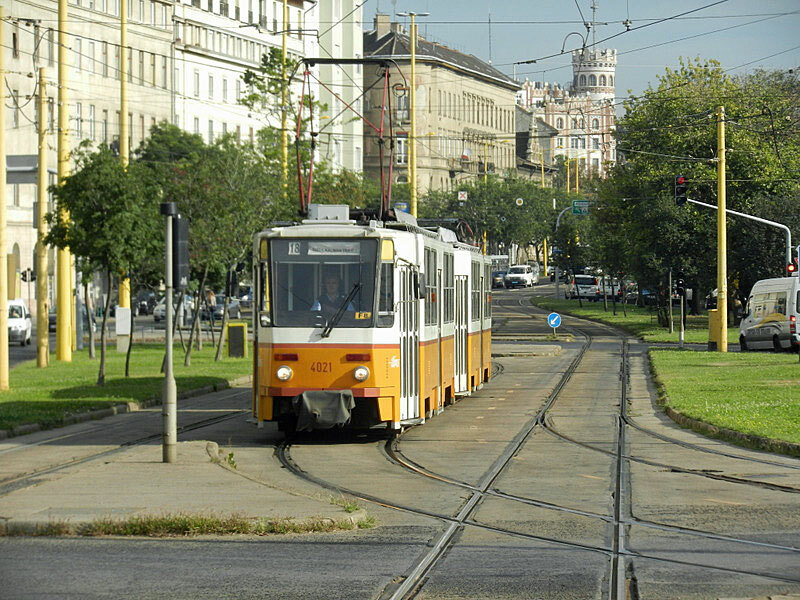 In operation since 1866, the network is presently one of world's largest tram networks, at about 196 km (122 miles) in total length. 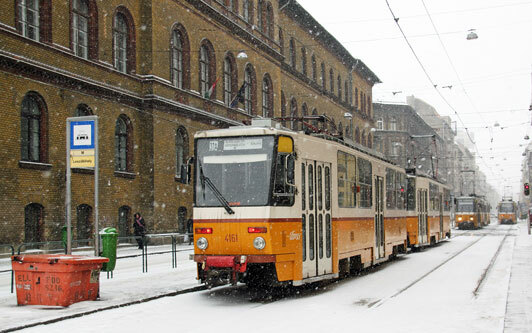 As of 2012, it was composed of 31 normal lines and the Budapest Rack Railway, operated by the BKV (Budapesti Közlekedési Válalat, Budapest Transport Limited). 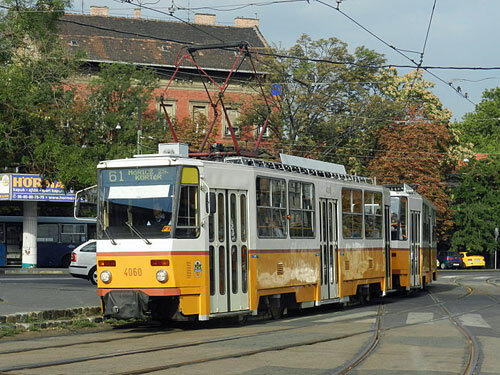 The first horse-tram line in Budapest was inaugurated on 30 July 1866 between Újpest-Városkapu and Kálvin tér, through Váci út. 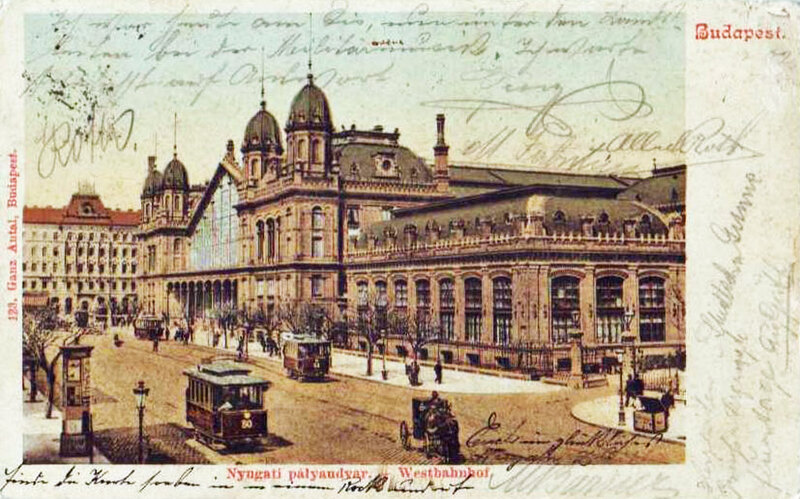 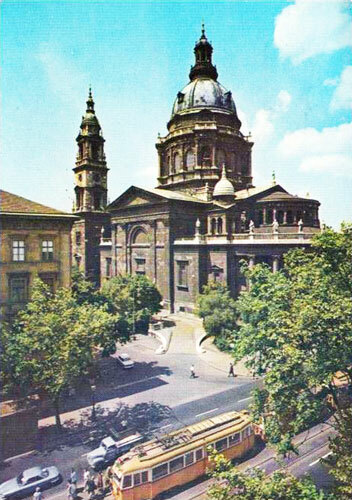 Thereafter, the Count Sándor Károlyi founded the PKVT (Pesti Közúti Vaspálya Társaság [Pest Road Rail Company]). 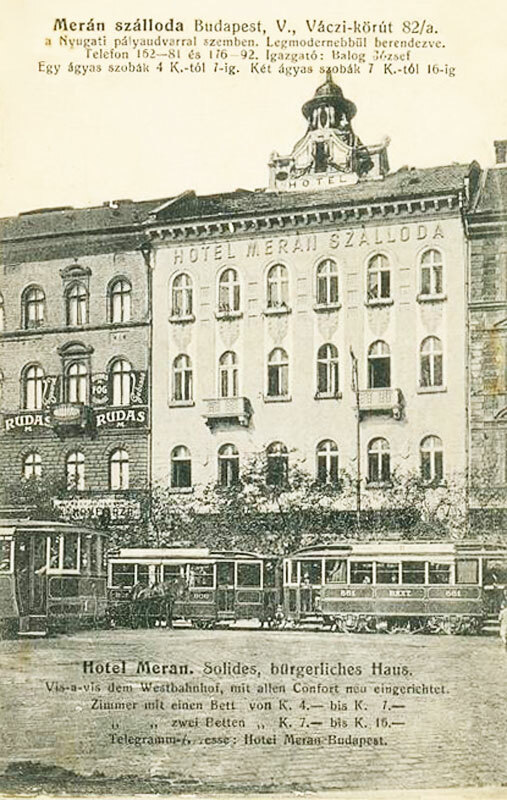 By 1885, Budapest had 15 horse tram lines but since it was obvious that the technology was obsolete, Mór Balázs suggested that a new, electric tram system should be introduced. 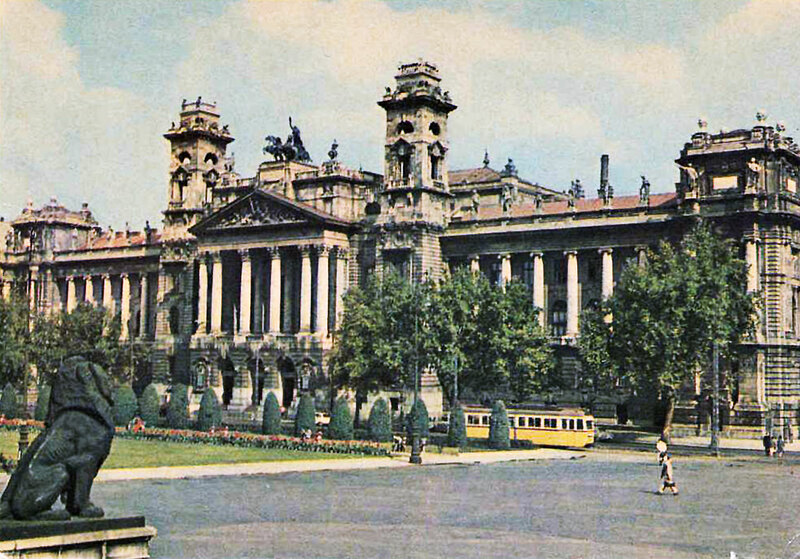 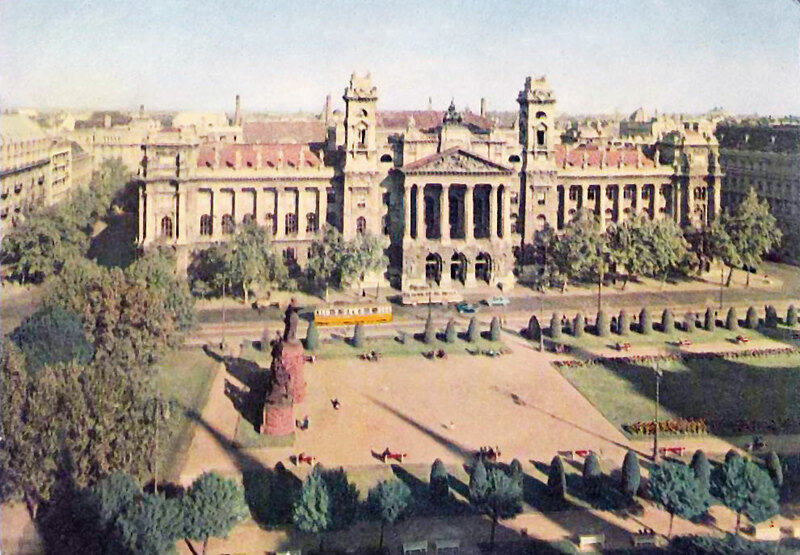 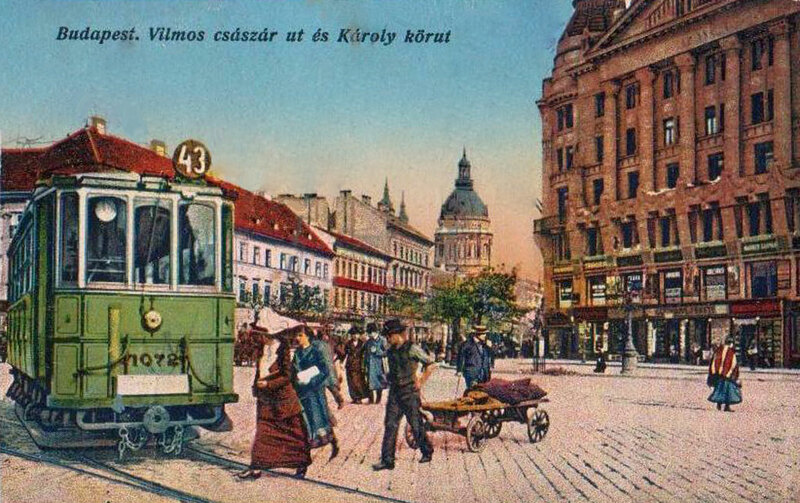 It was Gábor Baross, then secretary of state at the Ministry of Community Service and Transportation who authorised the construction of the first test tram line between Nyugati railway station and Király utca. 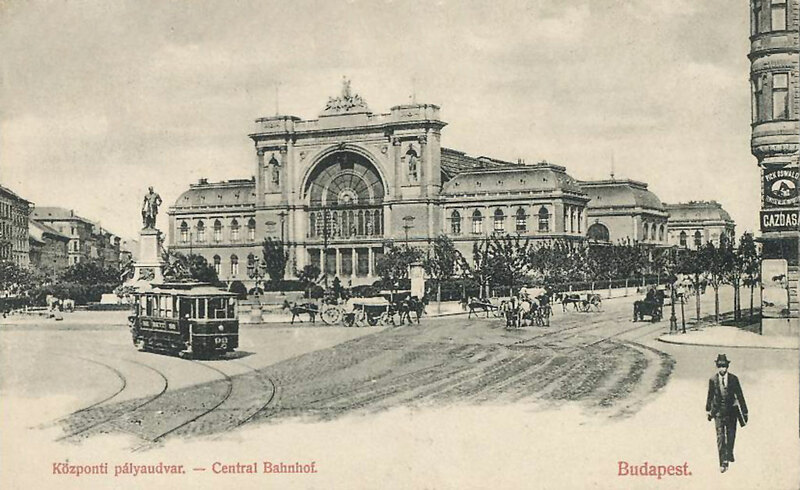 Balázs teamed up with Siemens & Halske and Lindheim és Társa and formed a new corporation: BVV (Budapesti Városi Vasút [Budapest City Trains]). 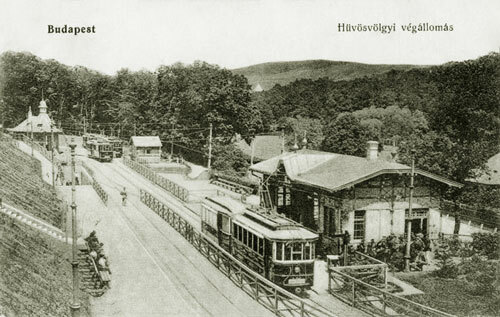 The construction works (carried out by Siemens & Halske) started on October 1, 1887 and the line was opened on November 28, 1887. 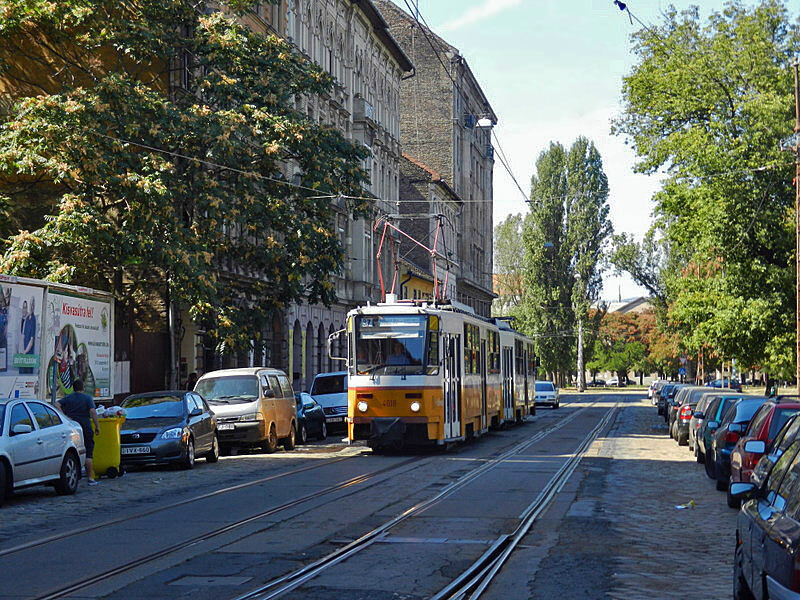 The track gauge of this first line was 1000 millimetres and electricity was supplied to the cars from below to avoid cables hanging across the street. 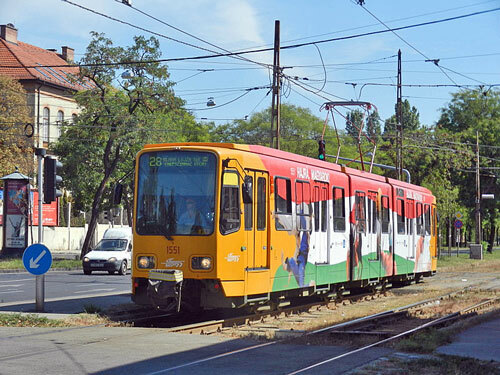 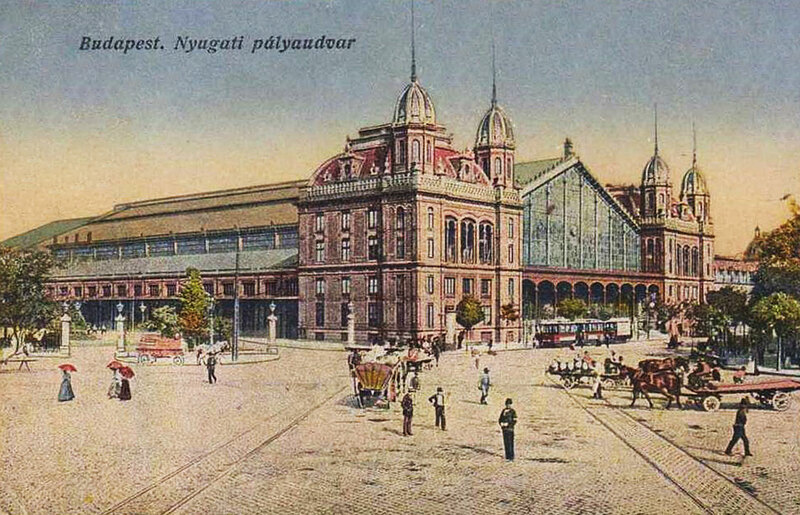 The second step in the expansion of the system were two standard gauge lines: on July 20, 1889 the second line, which spanned from Egyetem tér to Fiumei út via Kálvin tér, was opened. 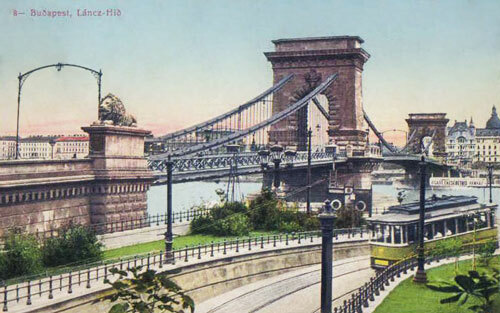 It was designed so that in case of a power failure steam engines could tow the carriages. 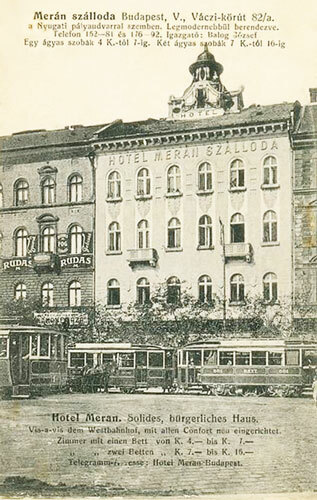 The third line, also standard gauge, was opened on September 10, 1889 and ran from the Hungarian Academy of Sciences to Andrássy út. 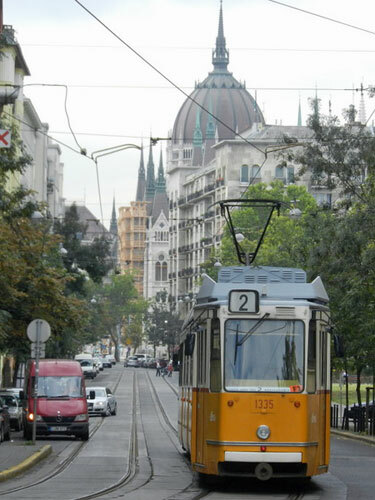 Even though not a tram line per se, the first underground line in Continental Europe, the Millennium Underground Railway must also be noted. 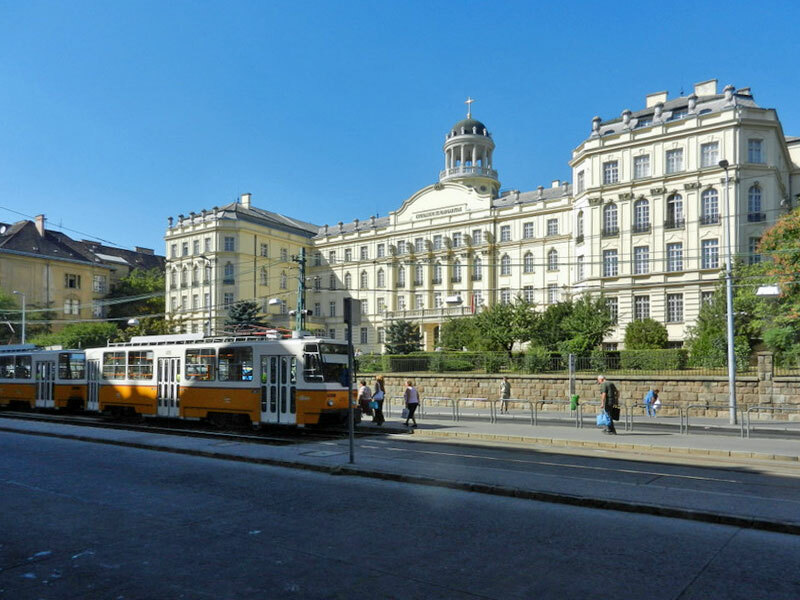 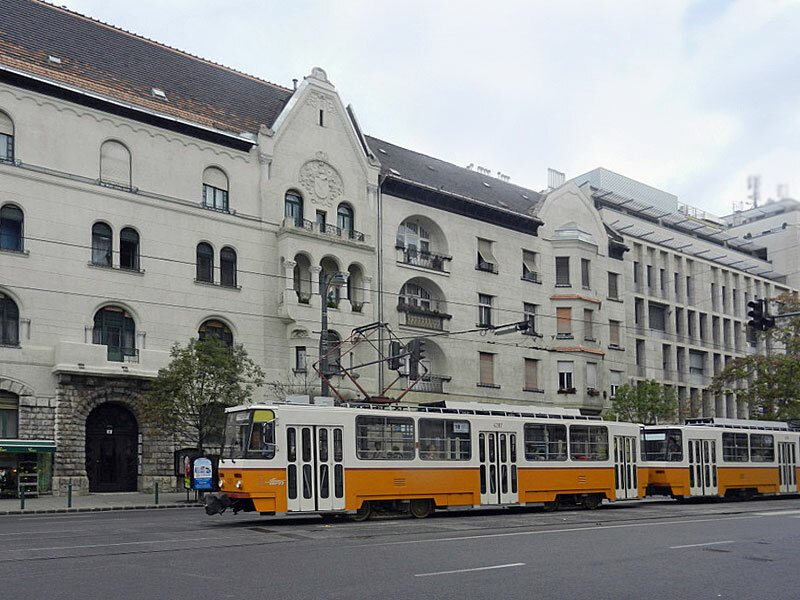 It was built using a cut-and-cover method between 1894 and 1896 and was first named FJFVV (Ferenc József Földalatti Villamos Vasút [Franz Joseph Underground Electric Railway]) after emperor Franz Joseph. It used electric cars from the start. 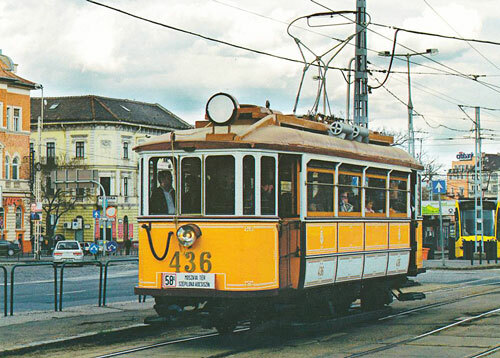 In the first years, tram had no numbers but coloured circular signals instead, for example, a simple red, green, blue or black disk; a red disk with a vertical white stripe or a cross; a white disk with a green 8-pointed green star, etc. This, of course, quickly became very cumbersome so around 1900, when there were already 30 lines, each line got a number – BVV, which was renamed to BVVV (Budapesti Villamos Városi Vasút [Budapest Electric City Trains]) got the even numbers; odd numbers were assigned to a rival transport company, BKVT (Budapesti Közúti Vaspálya Társaság [Budapest Road Rail Company]). 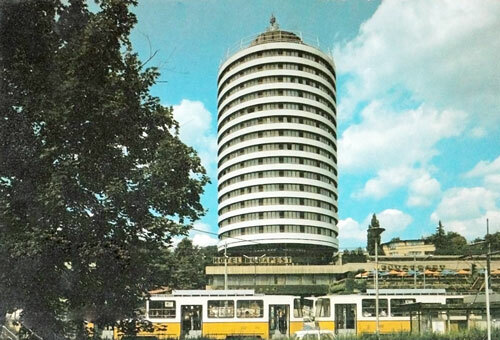 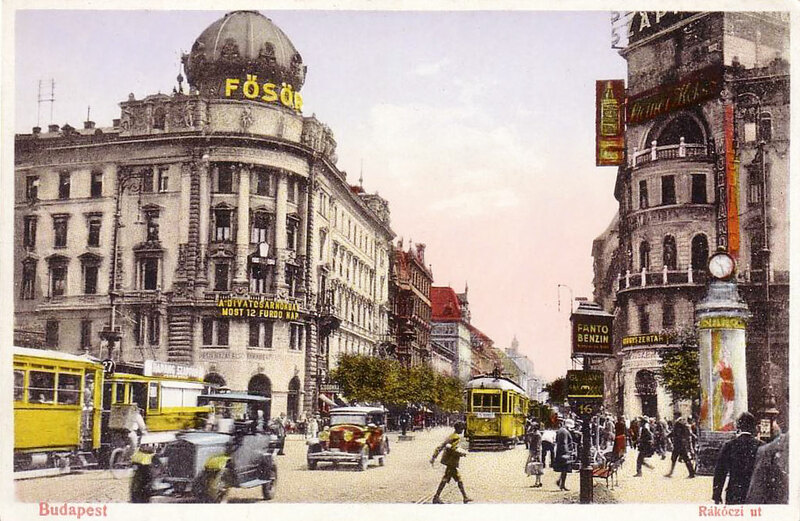 The dynamically growing network brought new companies: two of them served Újpest, the northern part of Pest, one Pestszentlőrinc, which then was a separate town, and one the southern part of Buda and the then-separate village Budafok. 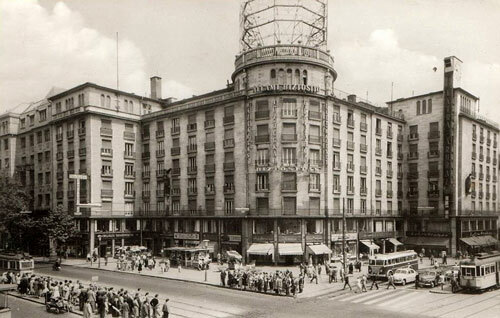 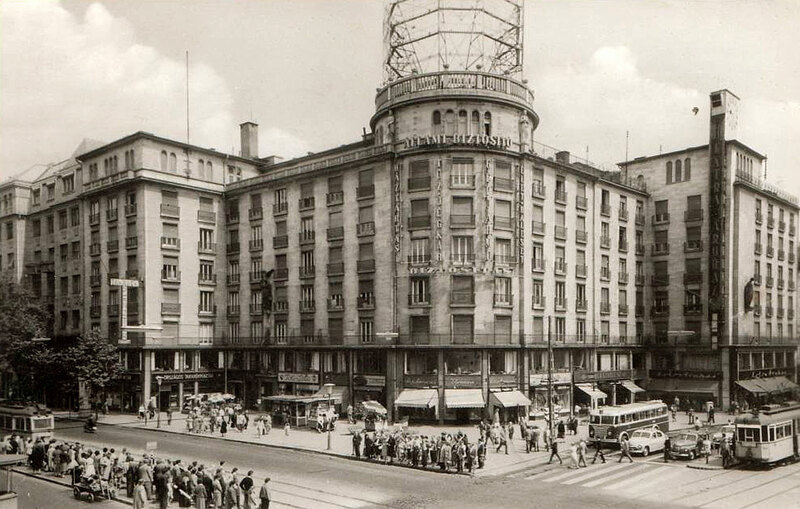 These companies were joined together in 1923 by the name BSZKRT (Budapest Székesfővárosi Közlekedési Rt., [Budapest Capital Transport Co.]). It was during 1939-1944 that the most tram lines (66) existed in the city. 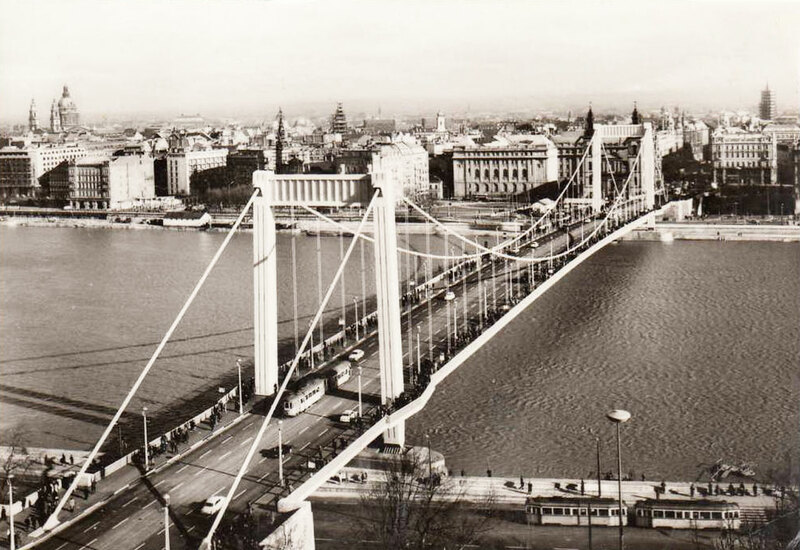 The WW2 siege of Budapest left the city with a crippled infrastructure: many houses were destroyed, as well as the bridges bombed, electric cables torn. It was of course of utmost importance to restore the transport network, however, many trams were destroyed either in the siege or in a depot fire that occurred in 1947. 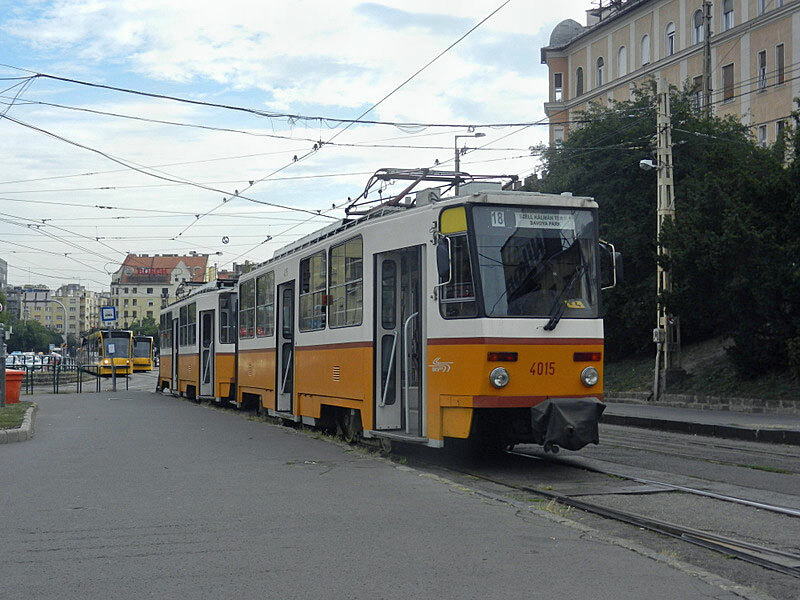 This might have been the cause that decision makers suggested that trolleybus lines should replace trams in the city centre. 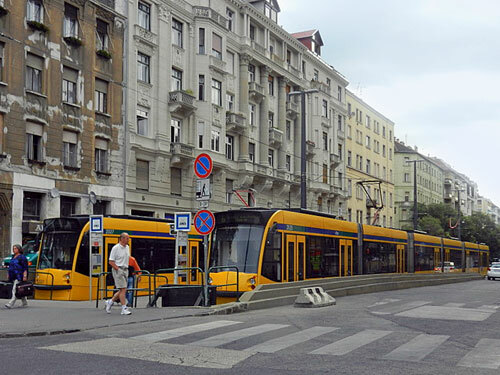 Along with cost considerations it is important to note that trolleybuses might be better suited for the downtown area than trams: they turn more easily and produce significantly less noise. 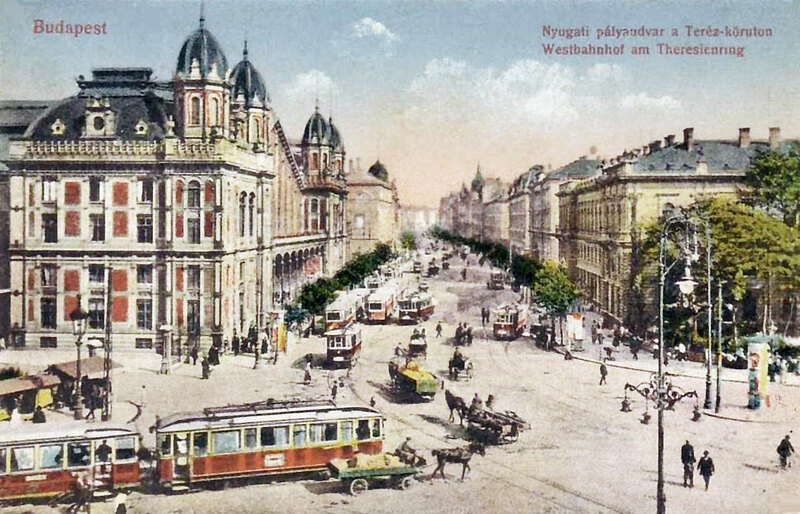 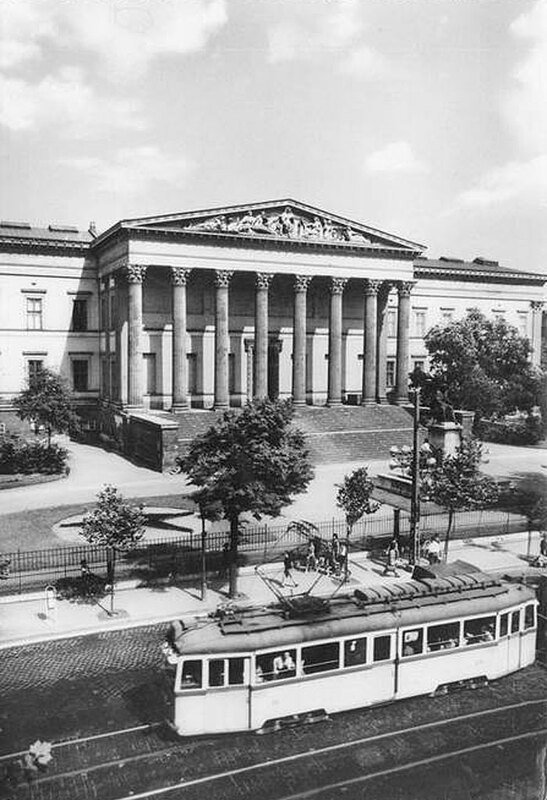 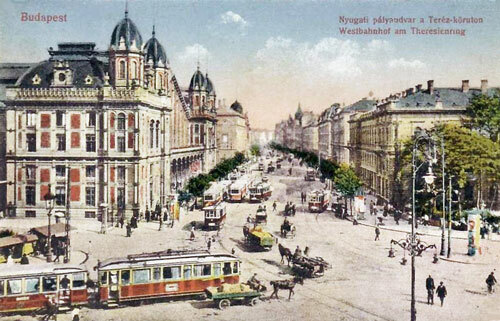 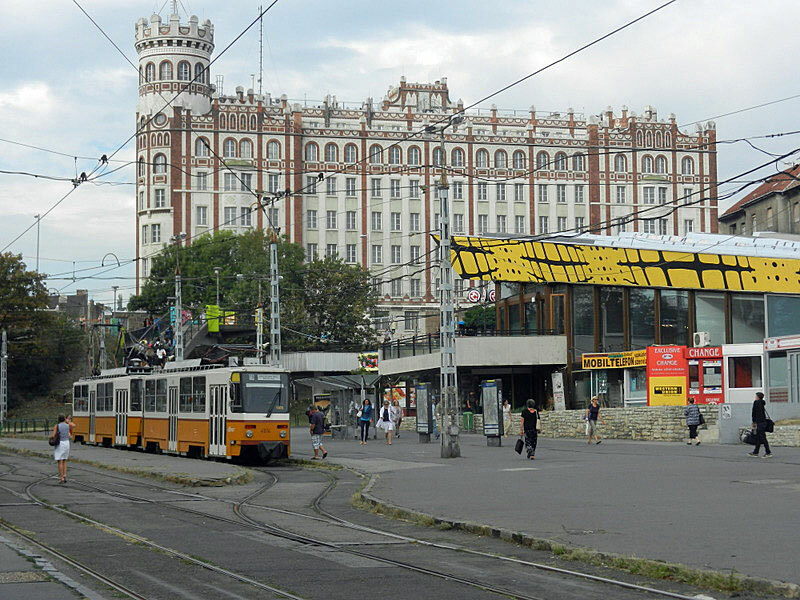 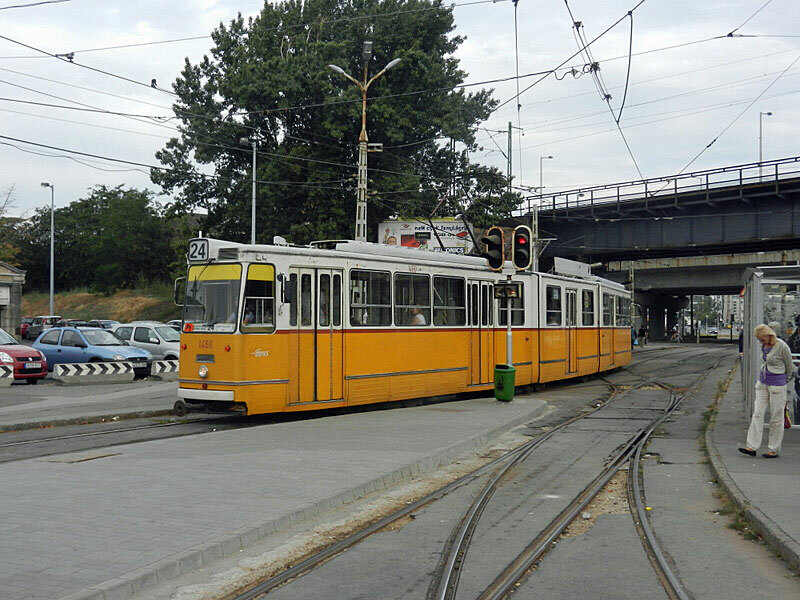 While some tram lines were abolished in favour of trolleybuses, the expansion of the system did not stop. 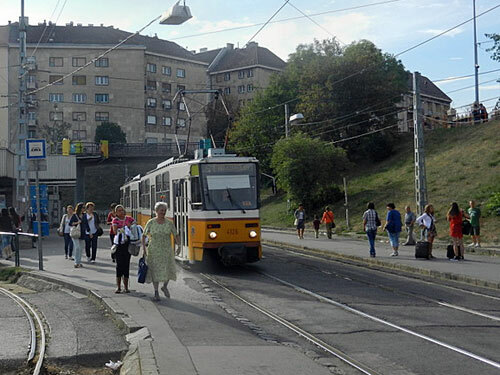 Near Nyugati railway station a new junction of tram lines were built to transport people back and forth to the factories in Angyalföld and Újpest and line 33 through the newly built Árpád Bridge. Line 4 on the Buda side and the tracks on Nagy Lajos Király Utja were also extended around 1960. 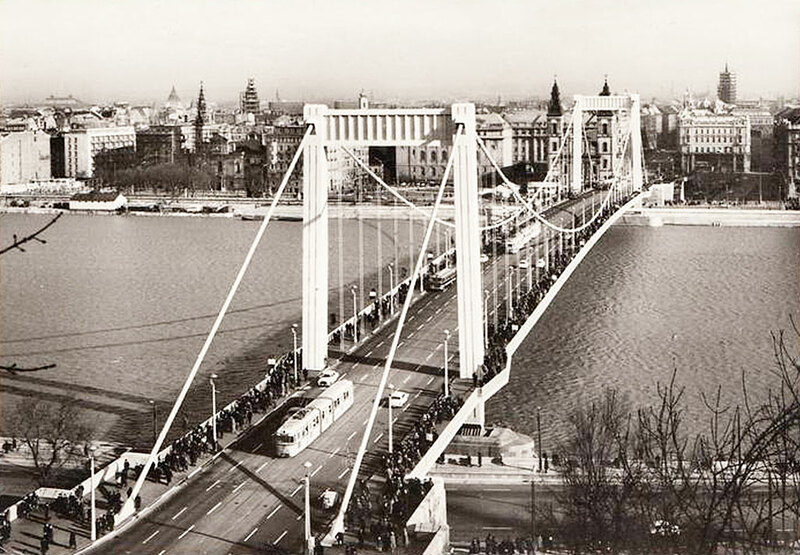 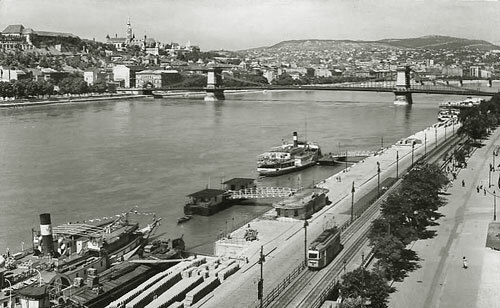 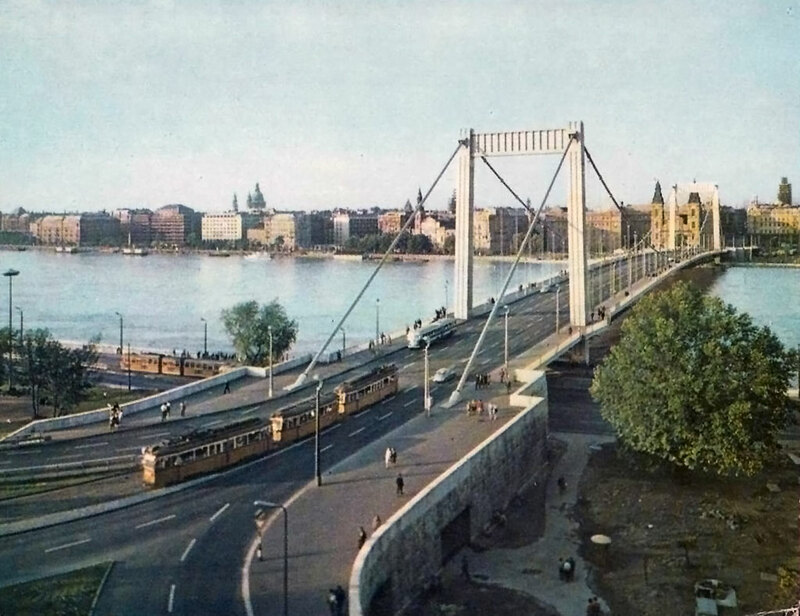 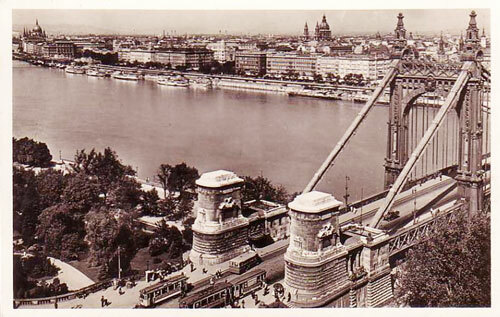 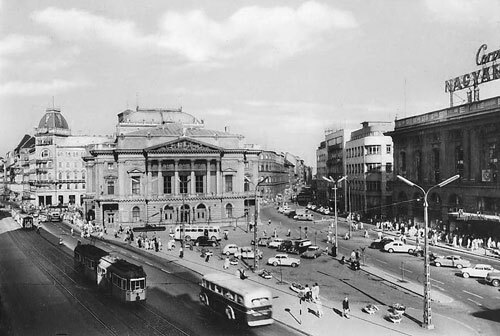 The reconstruction of Erzsébet Bridge in 1964 played a significant role in the revival of the tram network: five lines started using it after its opening. 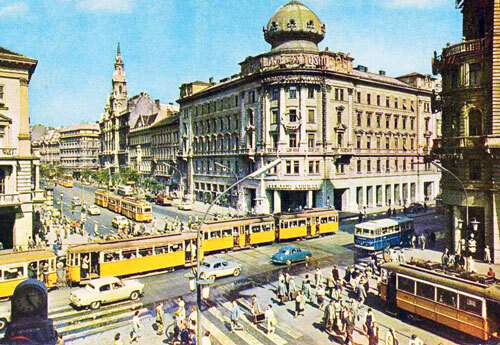 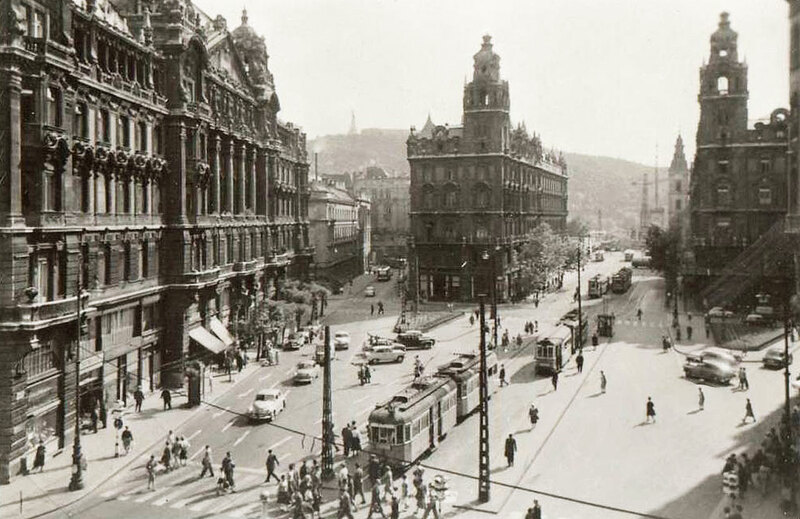 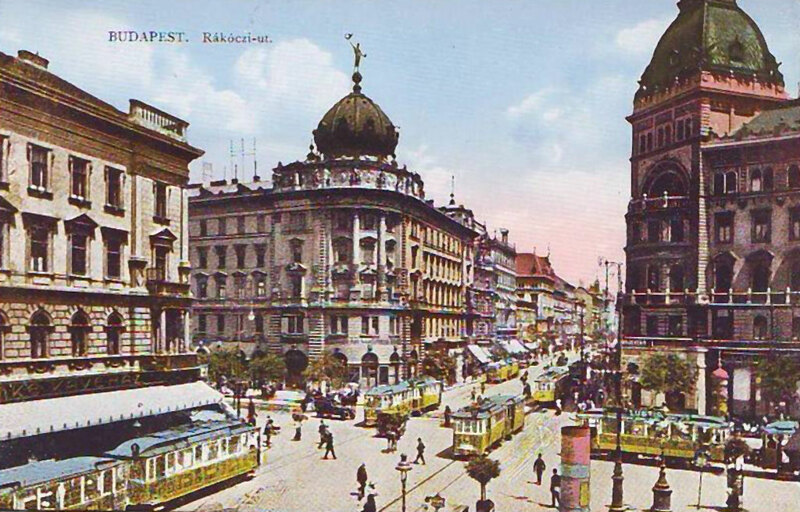 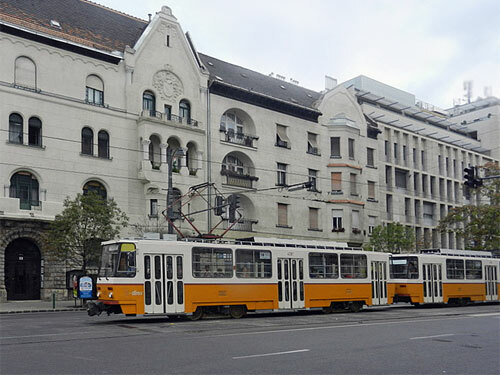 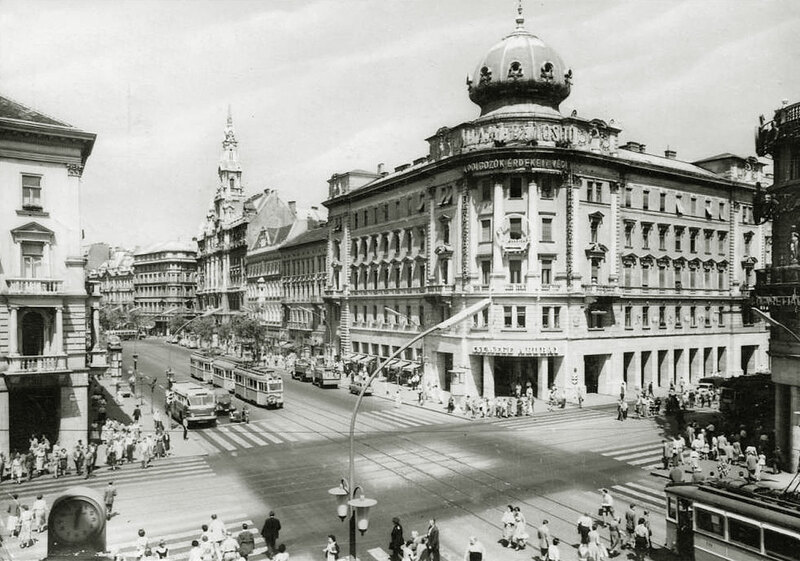 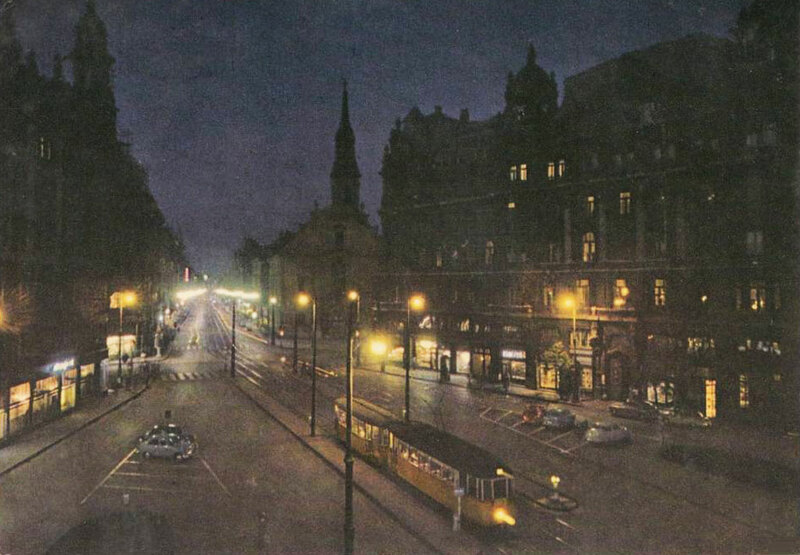 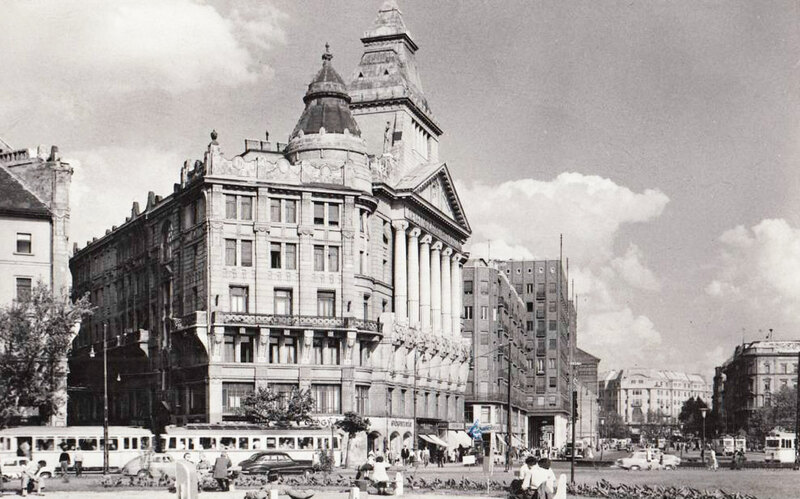 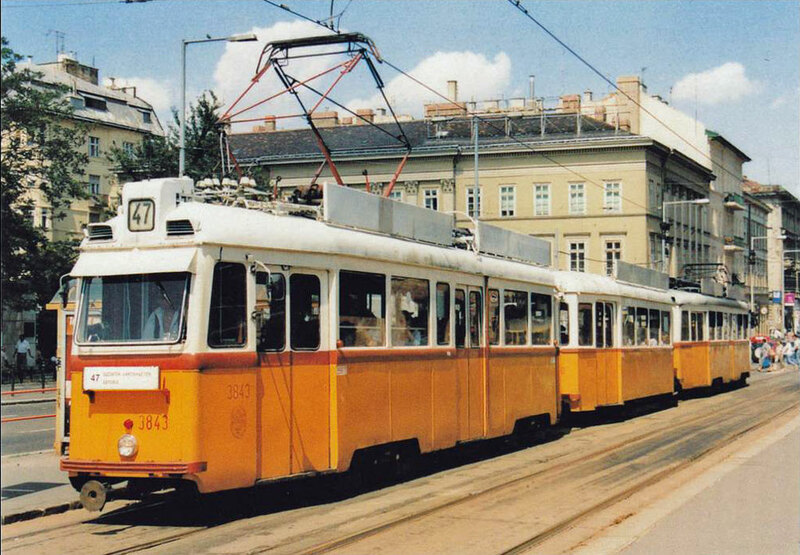 In 1968 there were 83 tram lines in Budapest (10 of which night services) thus reaching the largest extent of the network since World War II, decline was imminent. 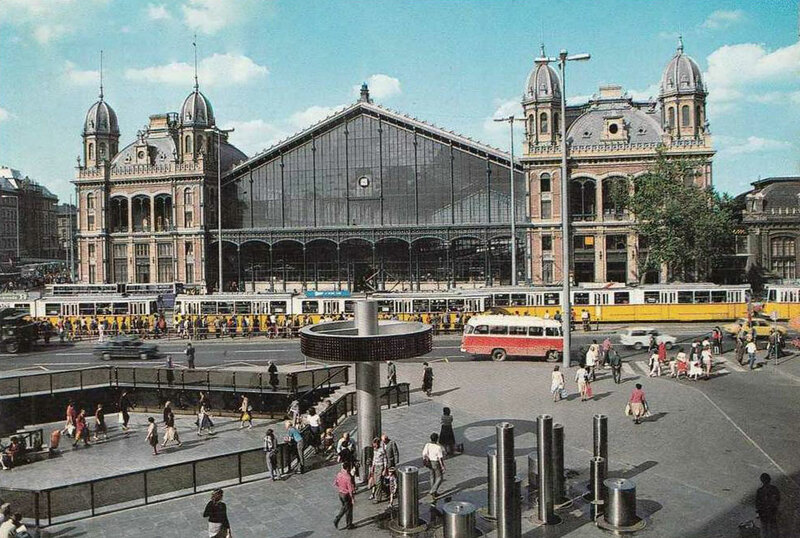 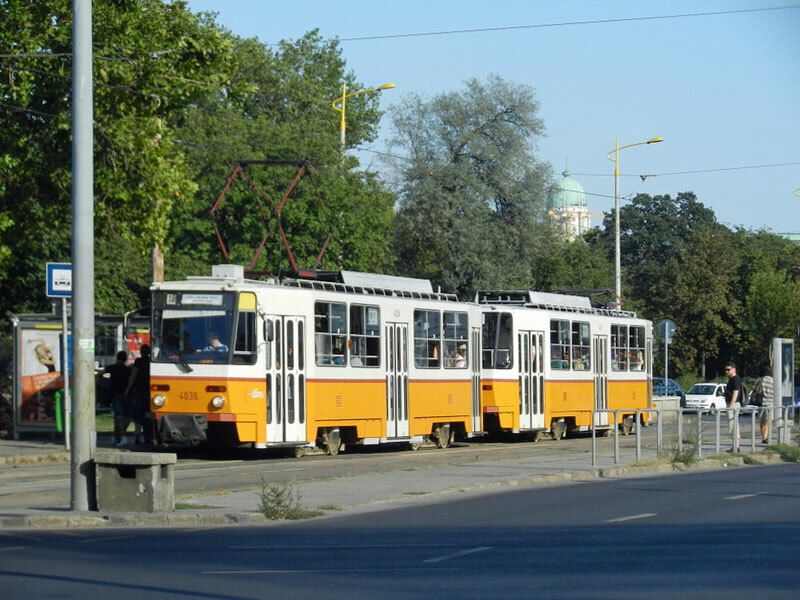 This happened partly because of the replacement of tram lines with single track and old vehicles with auto buses but also due to the construction of underground lines M2 and M3 which – were then thought to – replace tram lines that used to run above them. 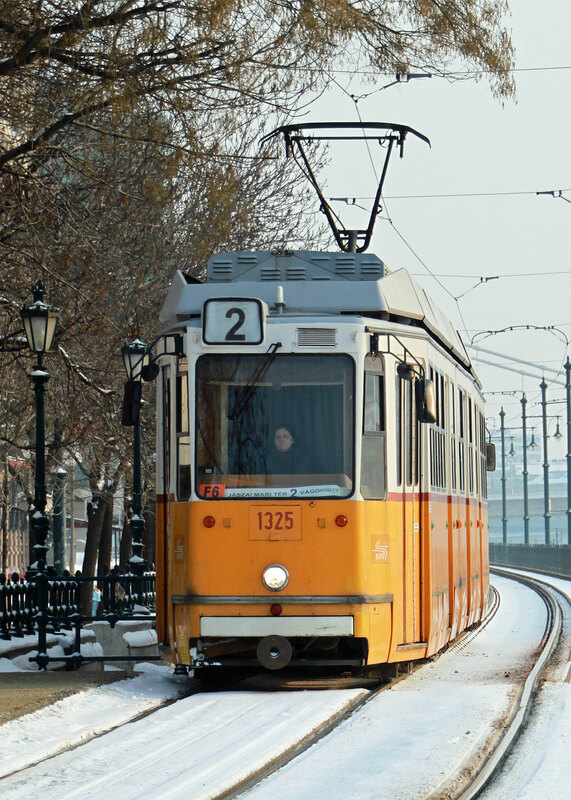 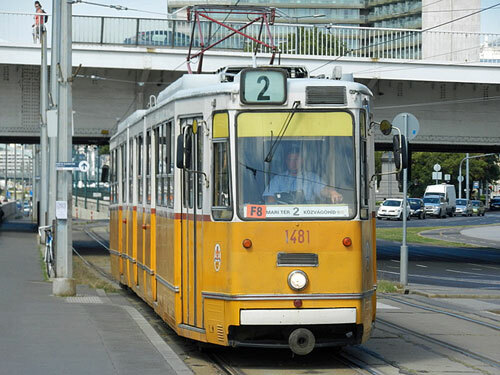 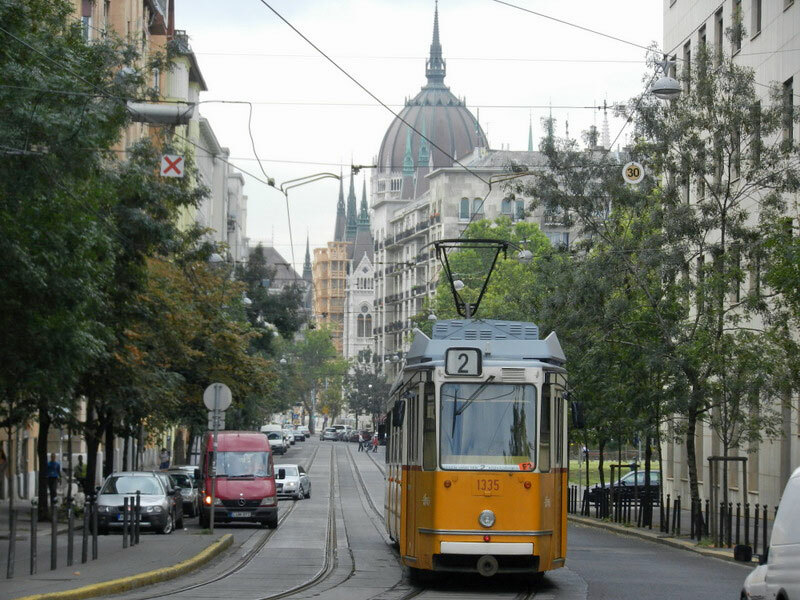 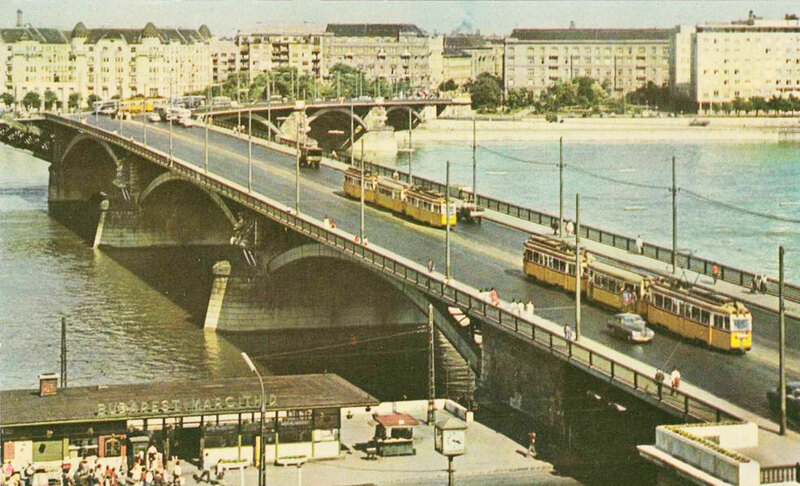 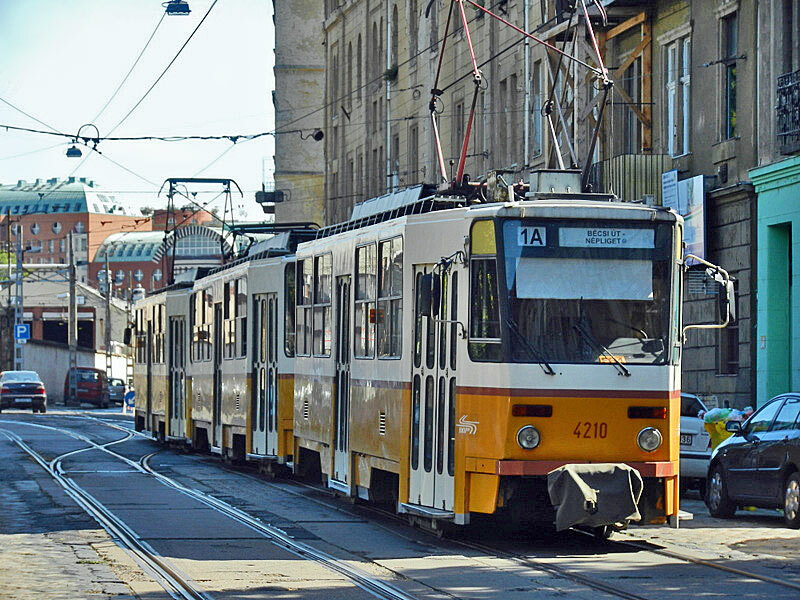 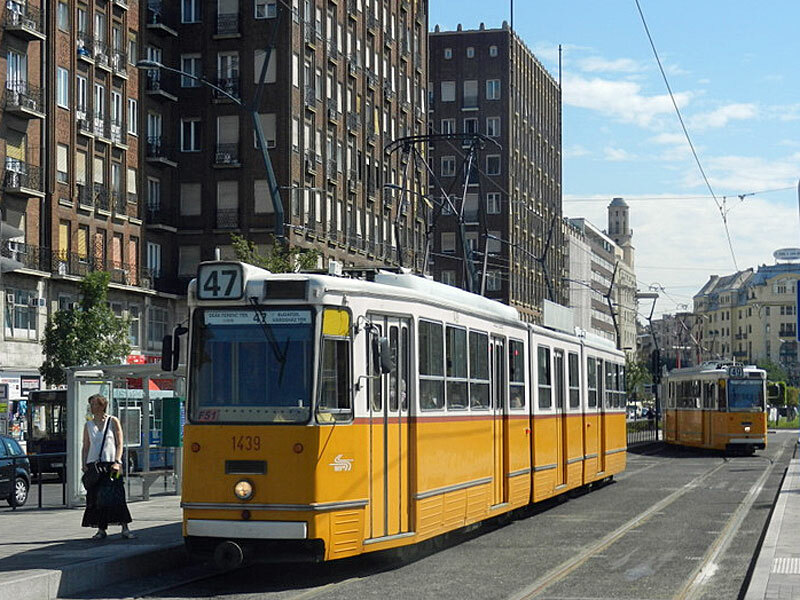 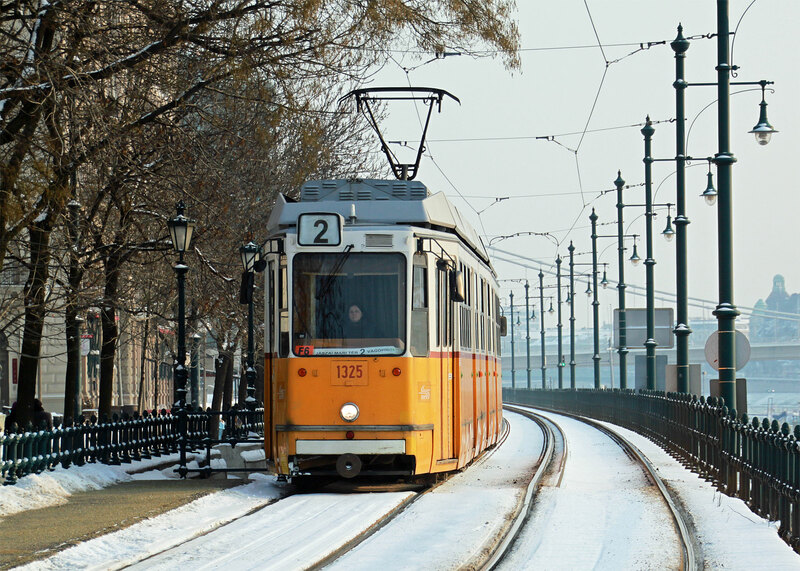 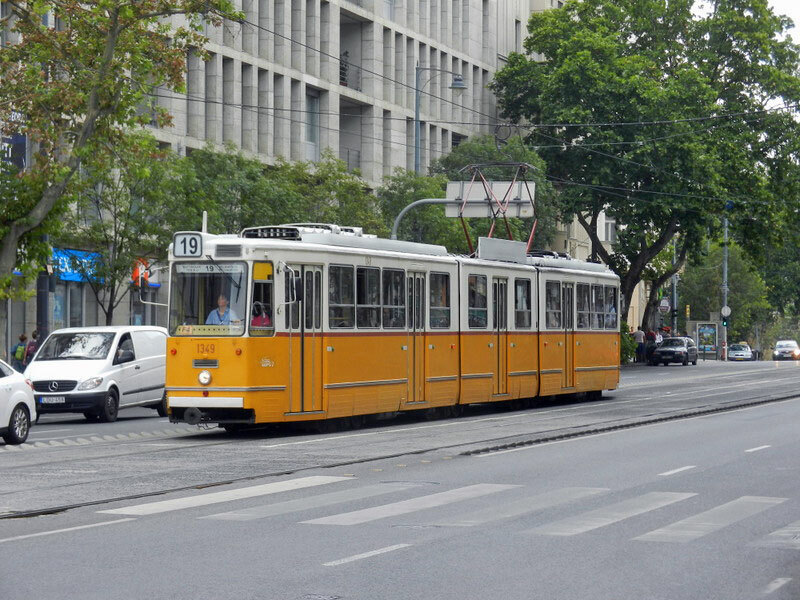 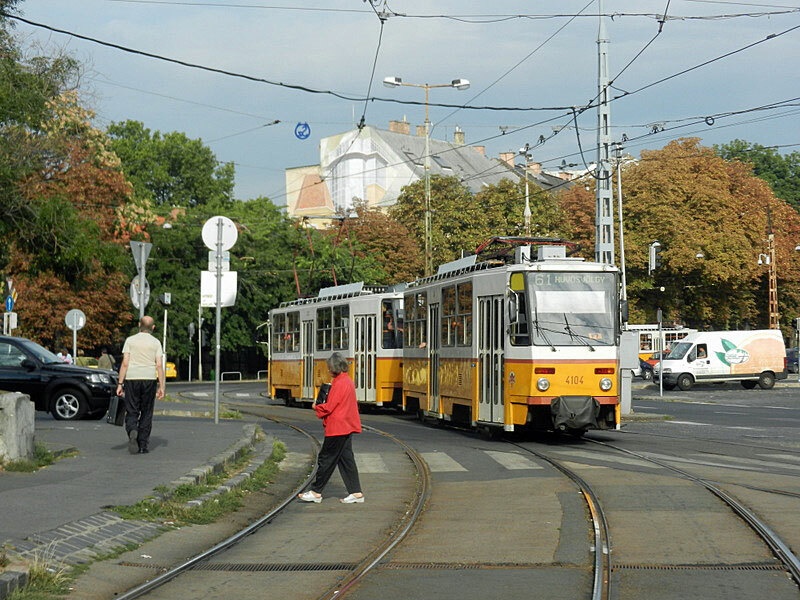 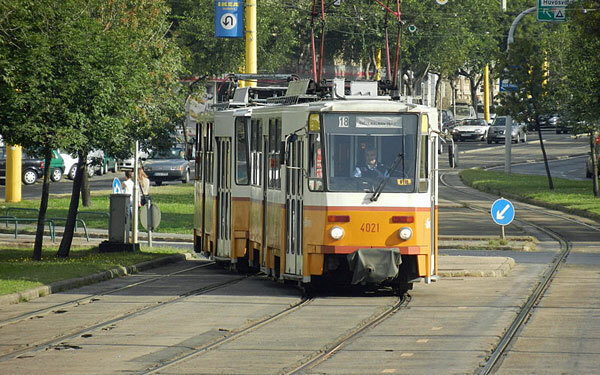 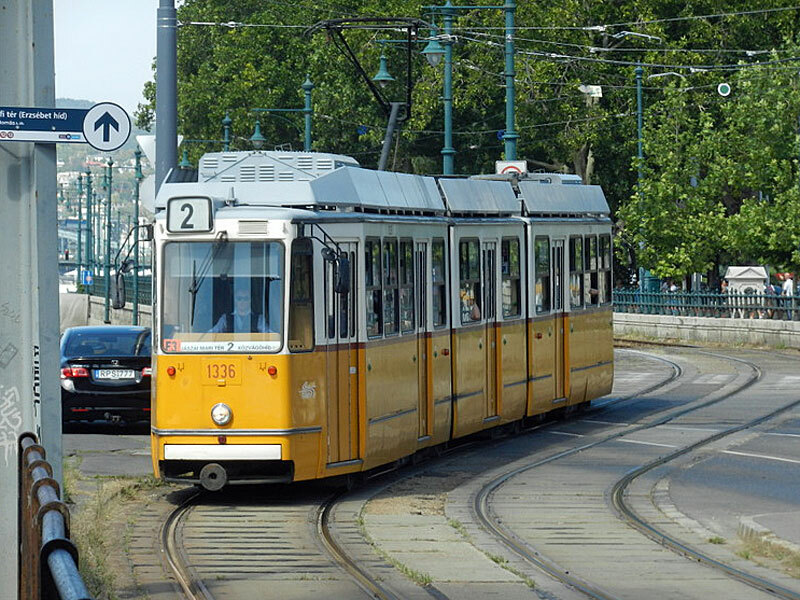 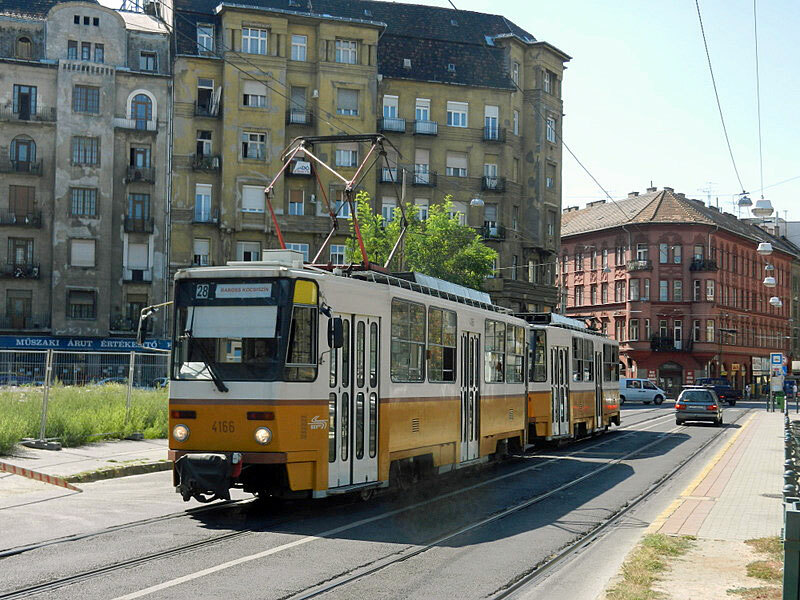 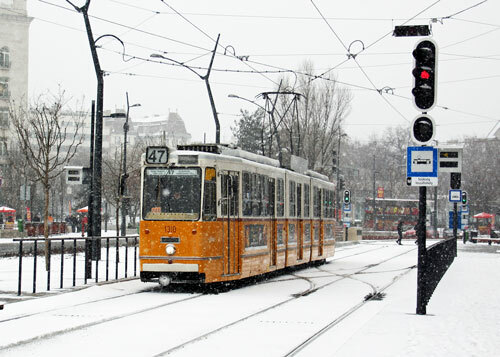 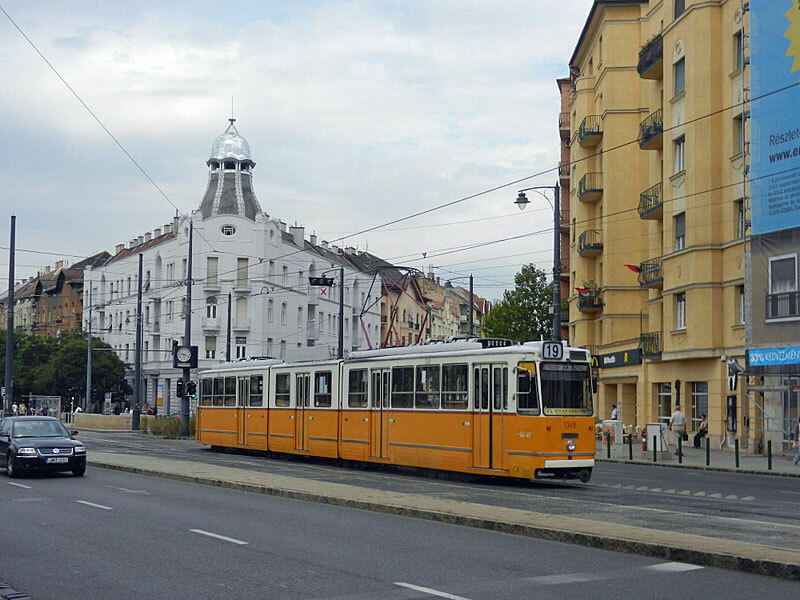 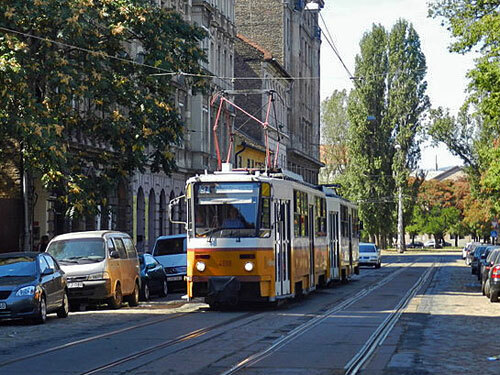 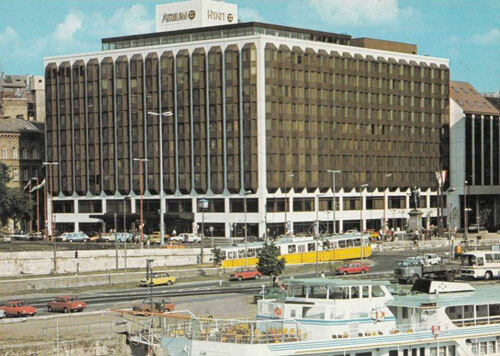 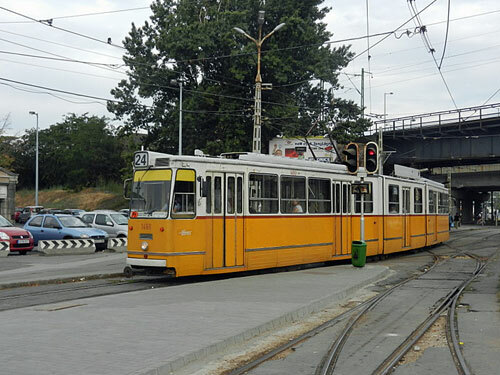 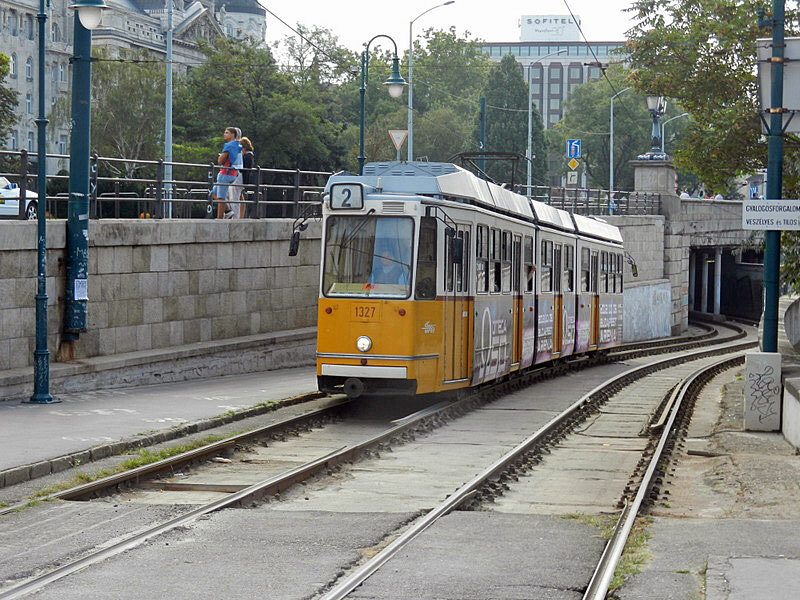 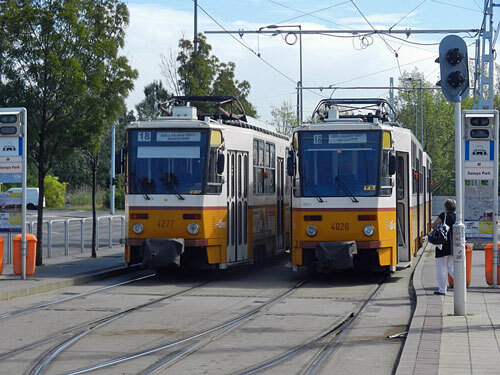 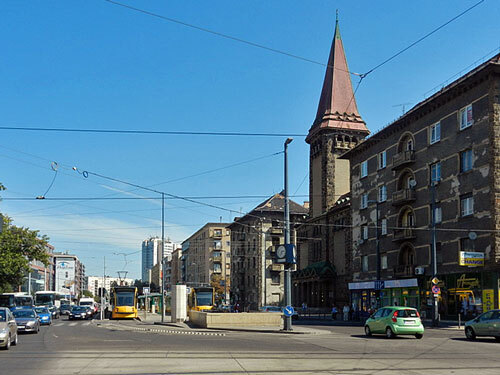 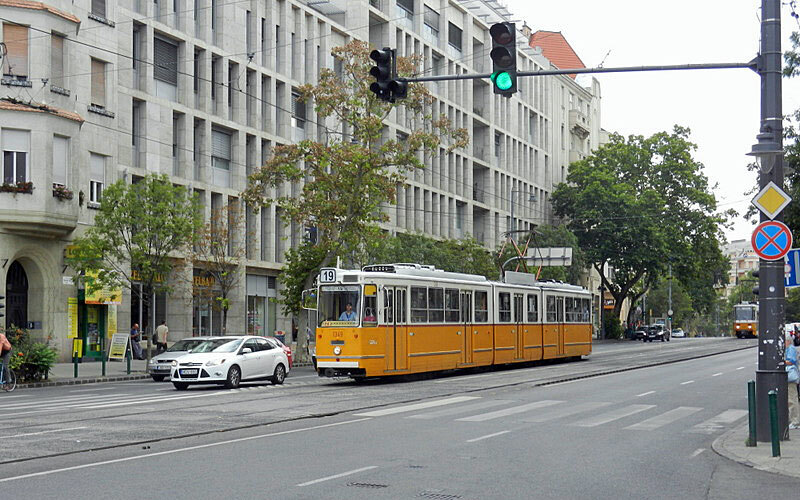 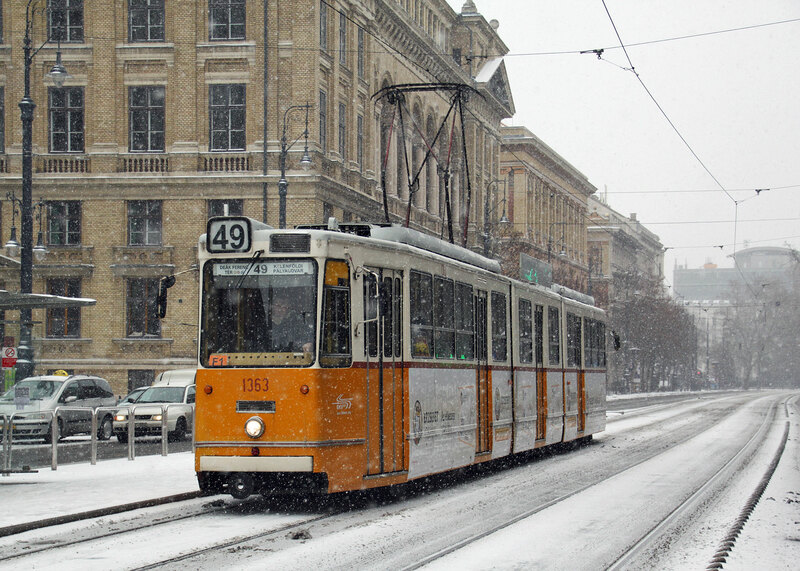 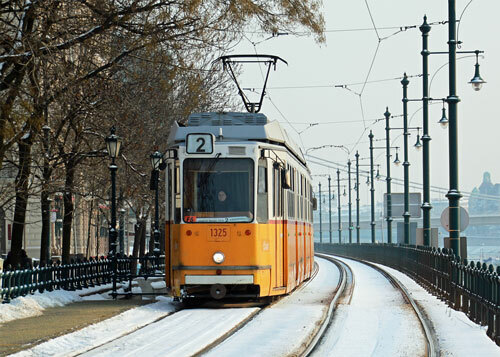 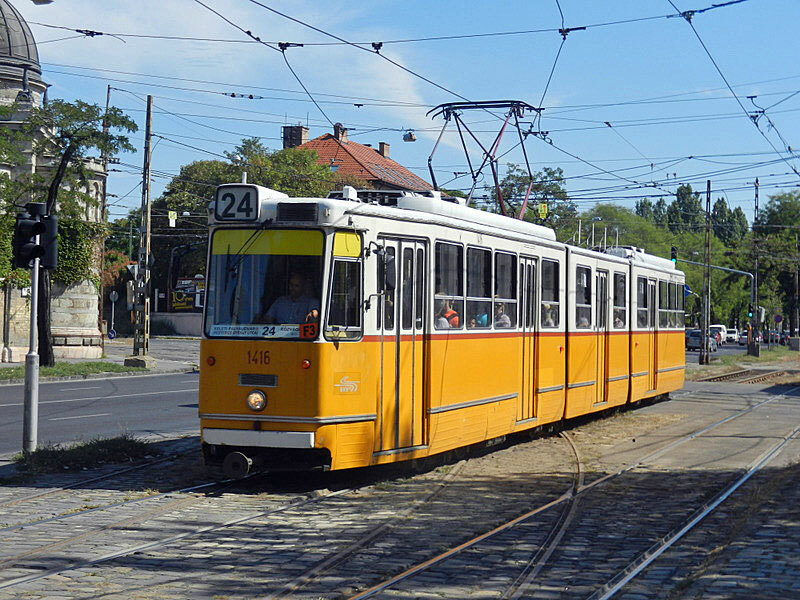 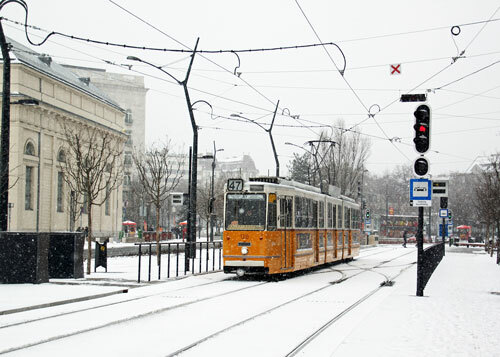 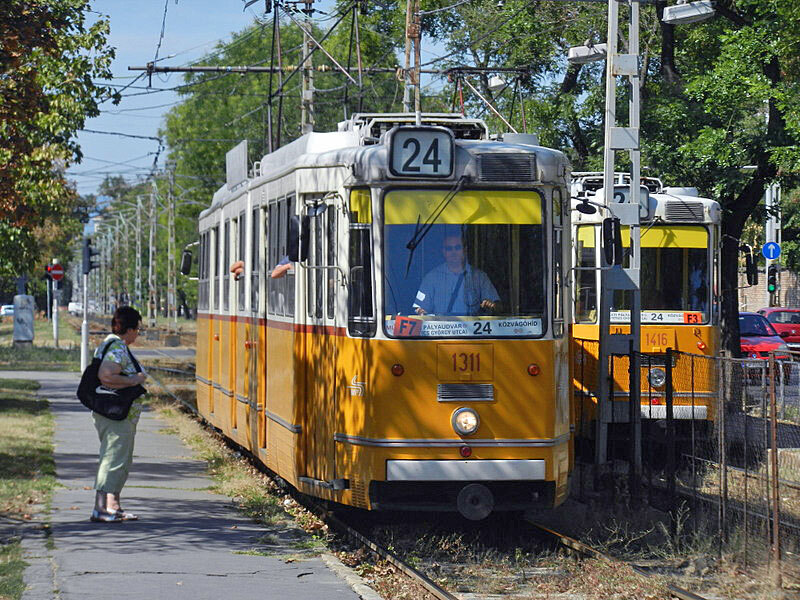 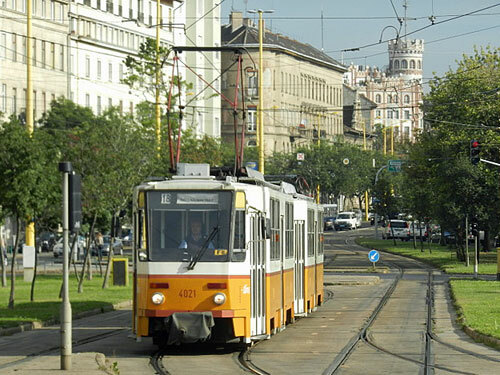 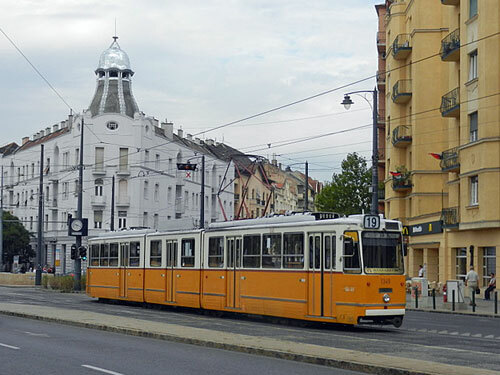 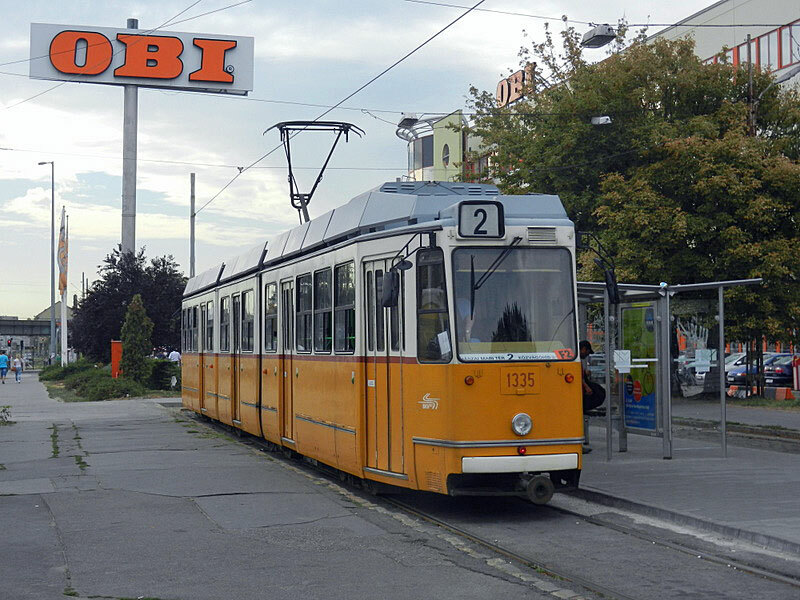 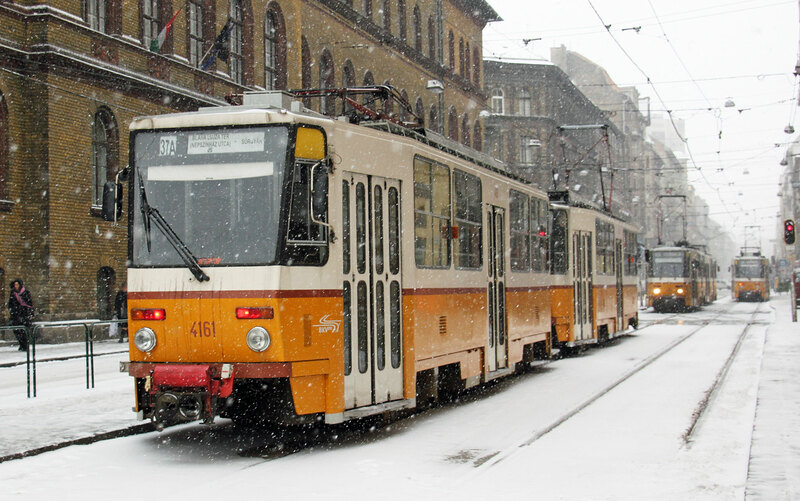 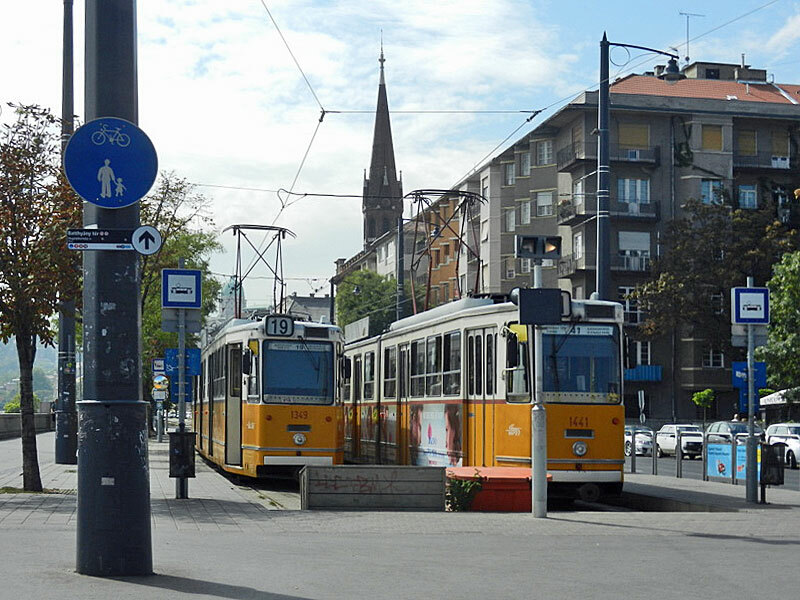 In 1972 tram lines on Erzsébet Bridge and Rákóczi way were abolished, then until 1982 tram lines were removed along M3 as well thereby effectively erasing 40 km of rail tracks, around 20% of the Budapest tram network. Along with lines in the city centre, most of the lines in Újpest and some in the southern parts of Pest were demolished. 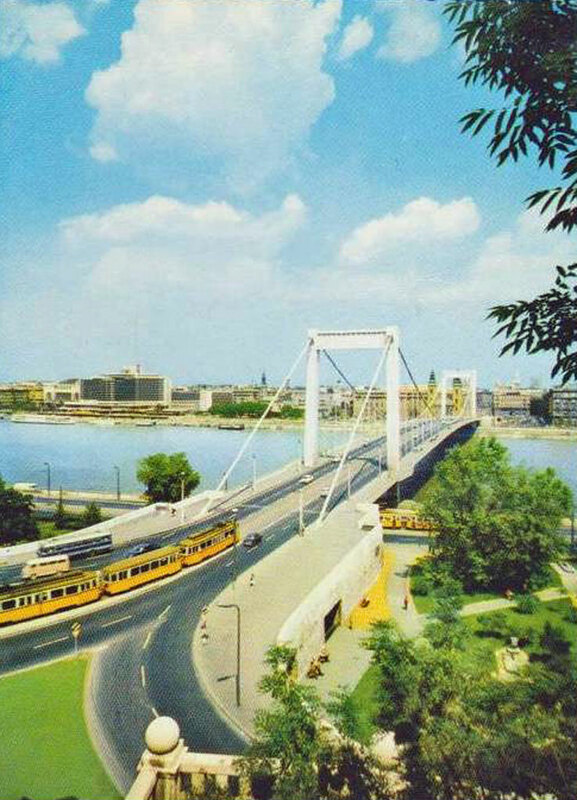 While many lines were closed down, a significant one was rising: tram 33 was shut down for the renovation of Árpád Bridge in 1981 but when the bridge was reopened, a new line was born on the eastern end of the outer ring road, Hungária körgyűrű, line 1. It has been under construction ever since with segments opened in 1984, 1987, 1990, 1993, 1995 and 2000 – the last one on the pest side of Rákóczi Bridge which was inaugurated in 1995 and was designed for the tram to cross it. 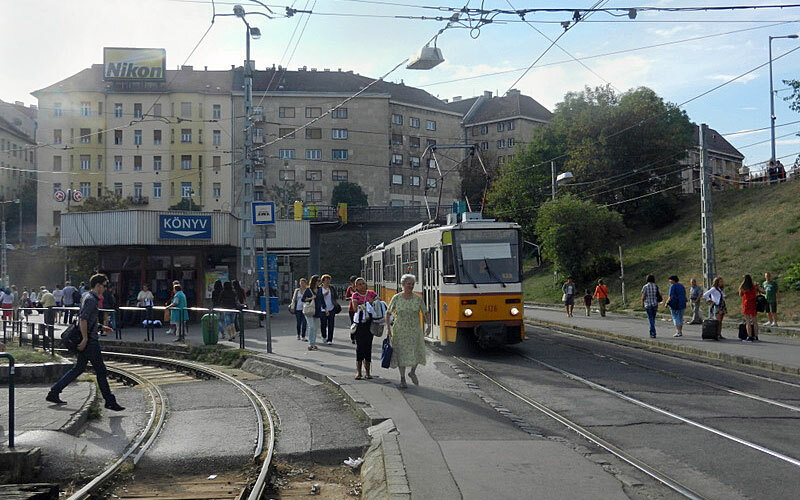 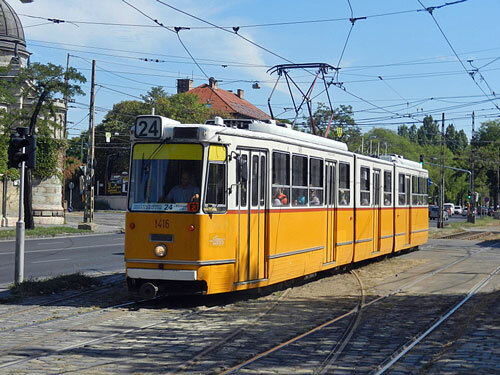 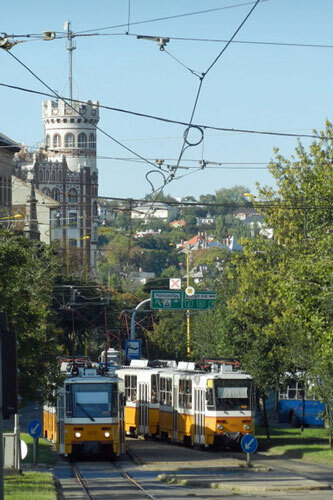 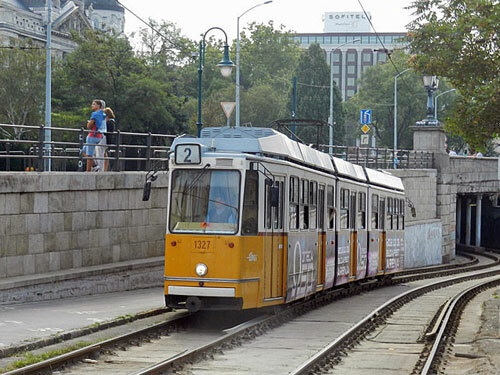 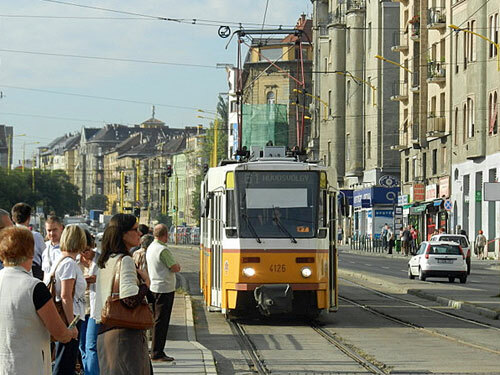 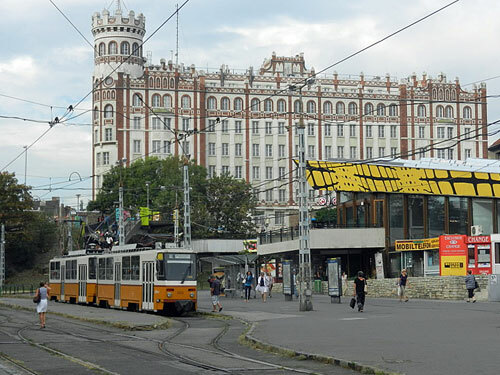 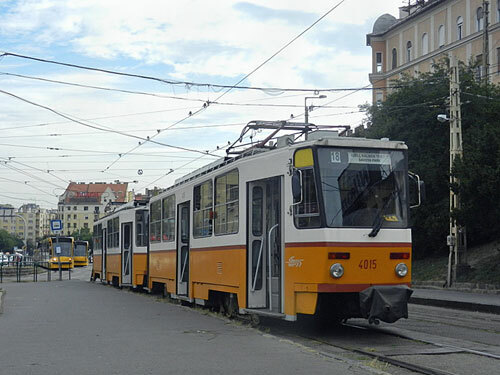 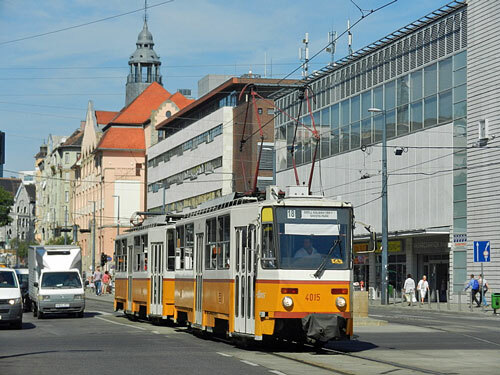 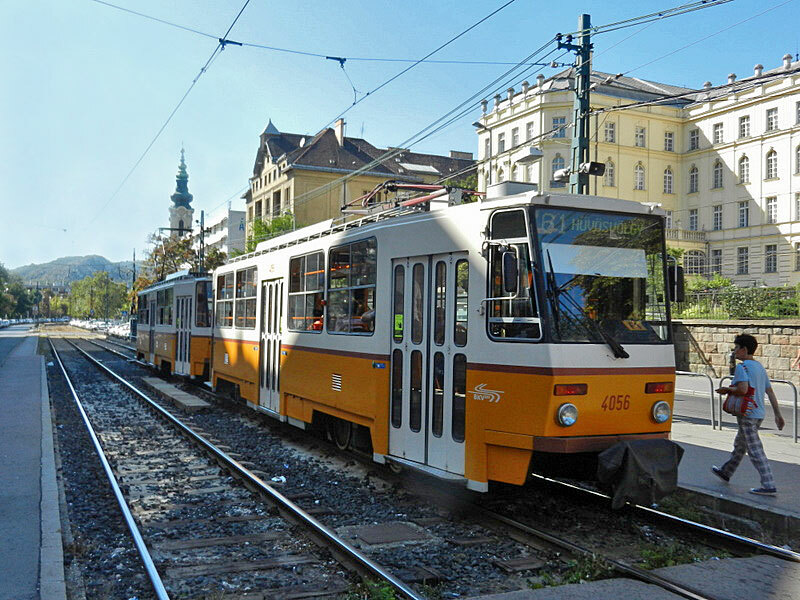 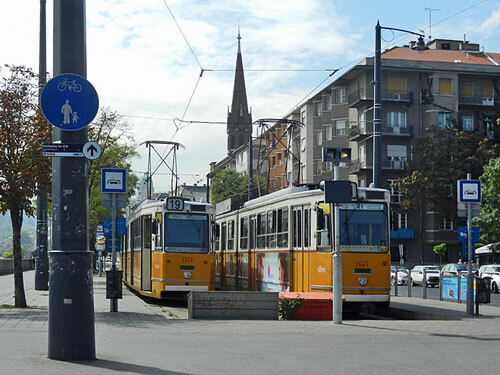 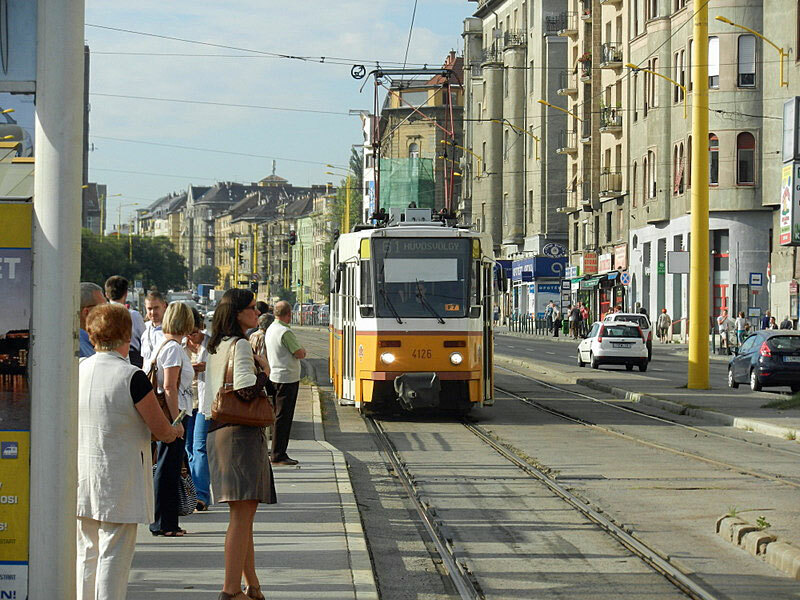 As of 2012, it seems that the local governments have shifted towards a more tram-friendly view: line 1 and 3 will be renovated and line 1 extended (mostly from EU funding); line 47 and 49 are planned to reach Nyugati tér once again as it used to be their final stop before M3 was opened. 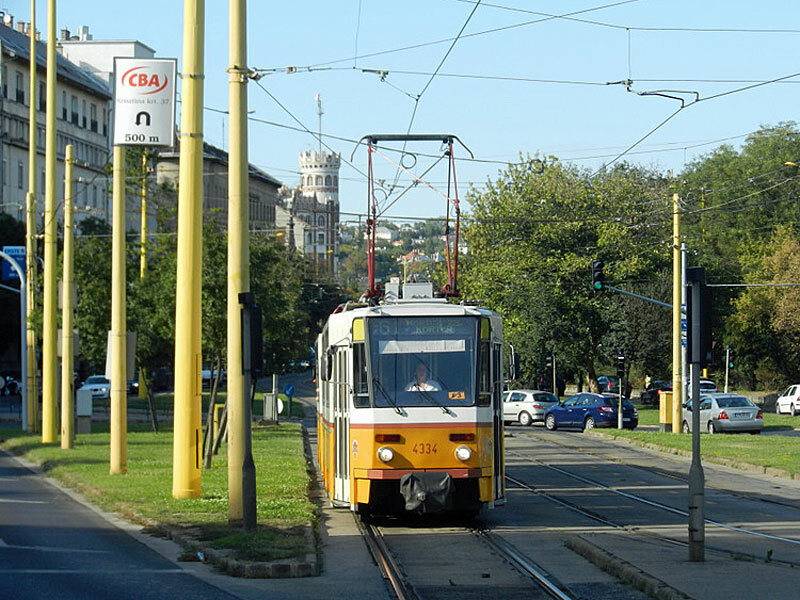 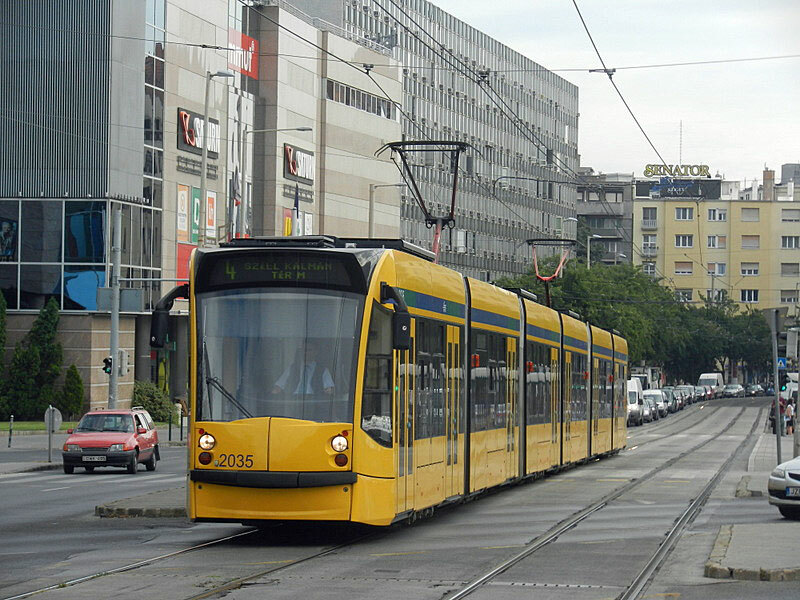 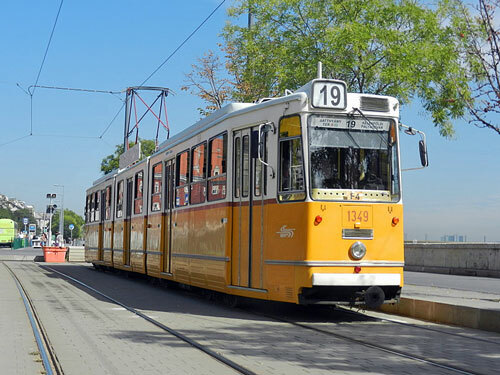 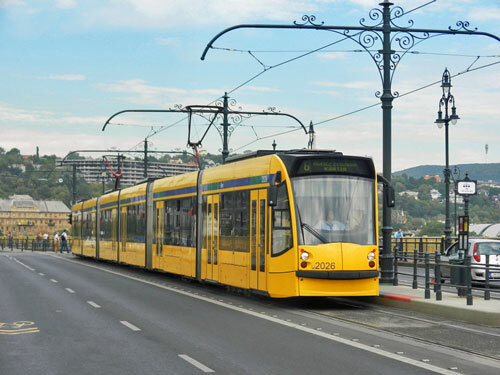 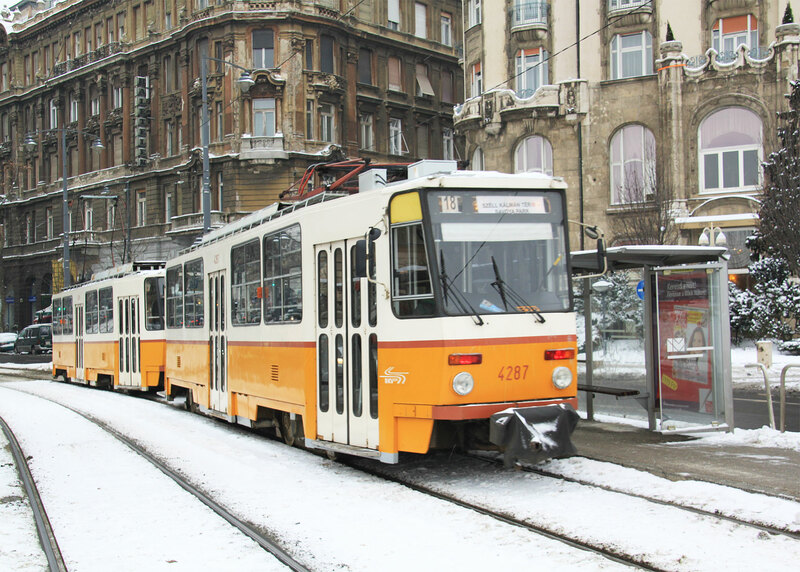 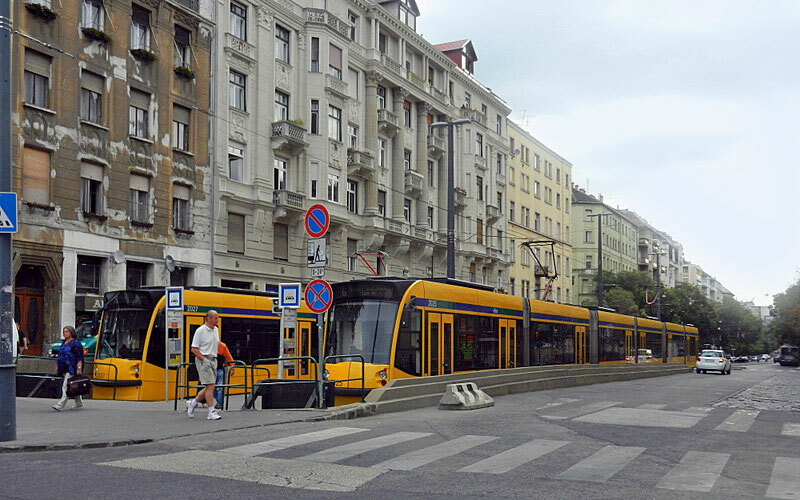 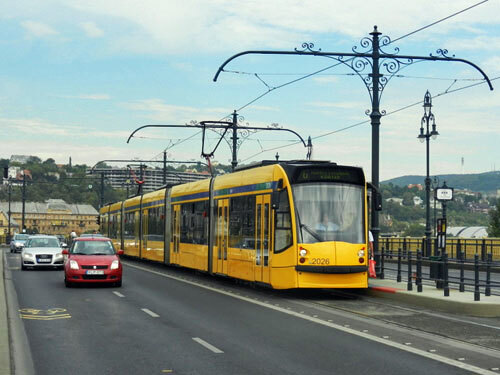 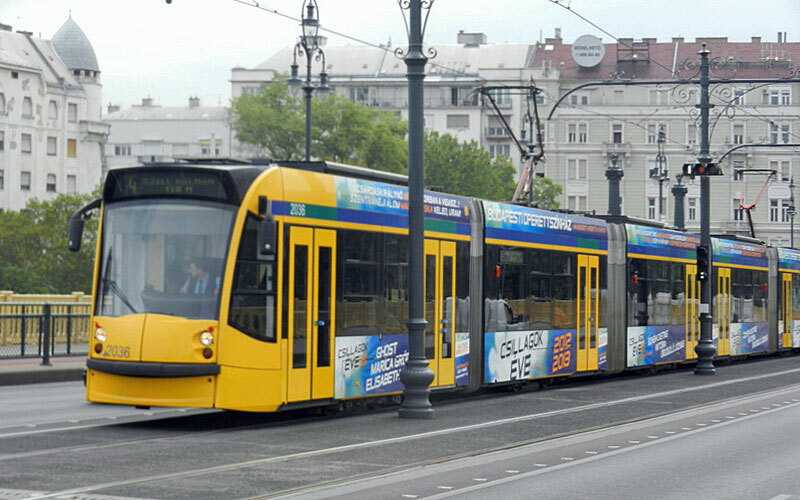 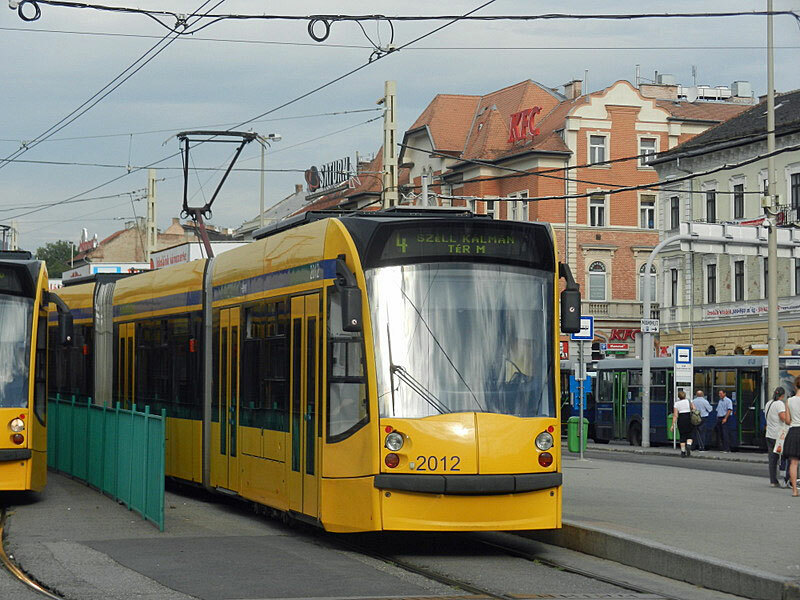 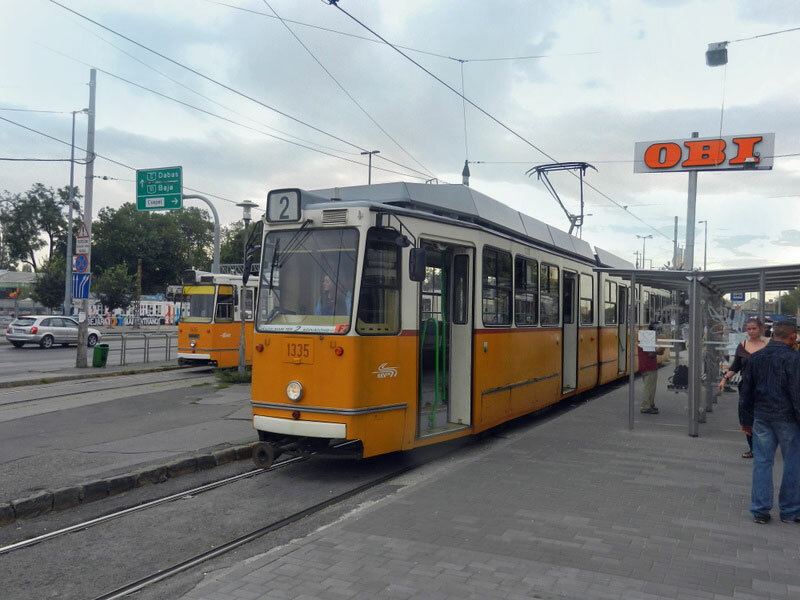 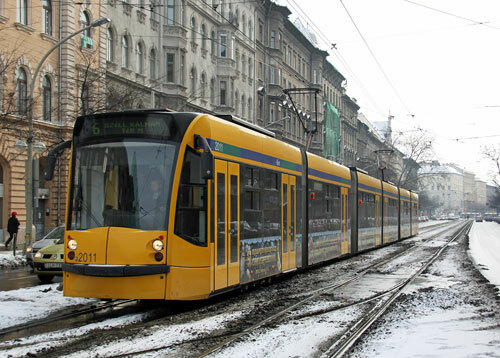 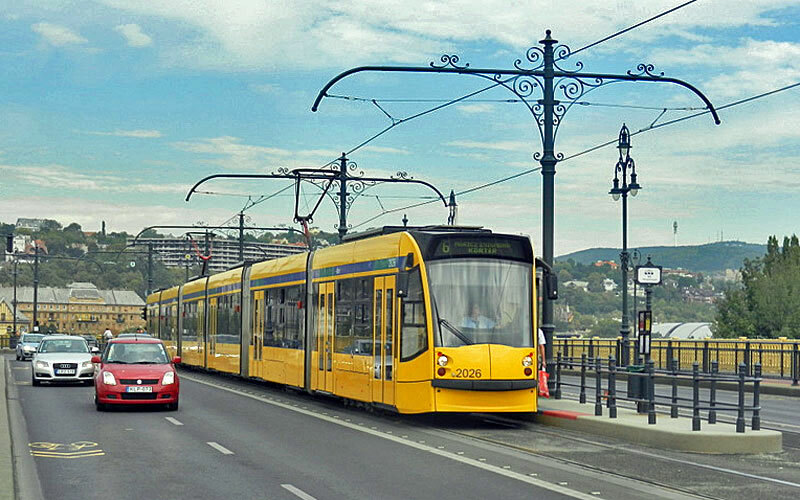 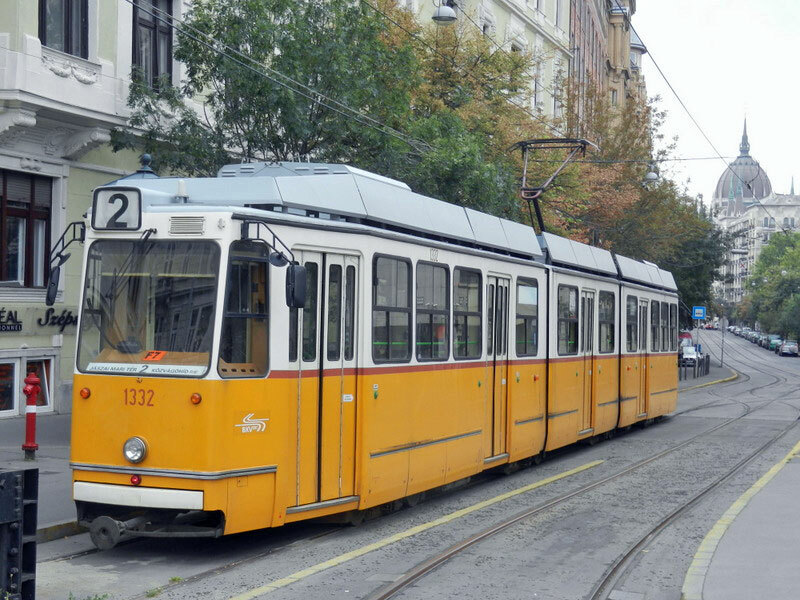 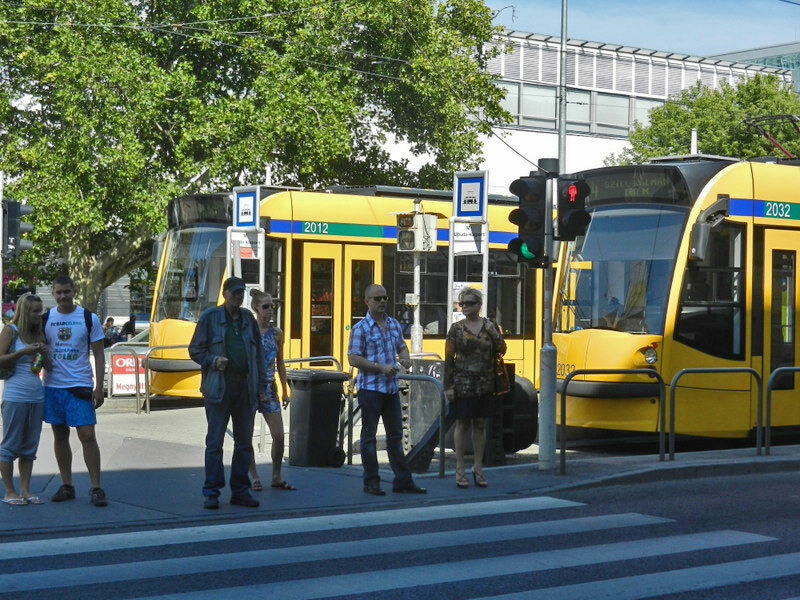 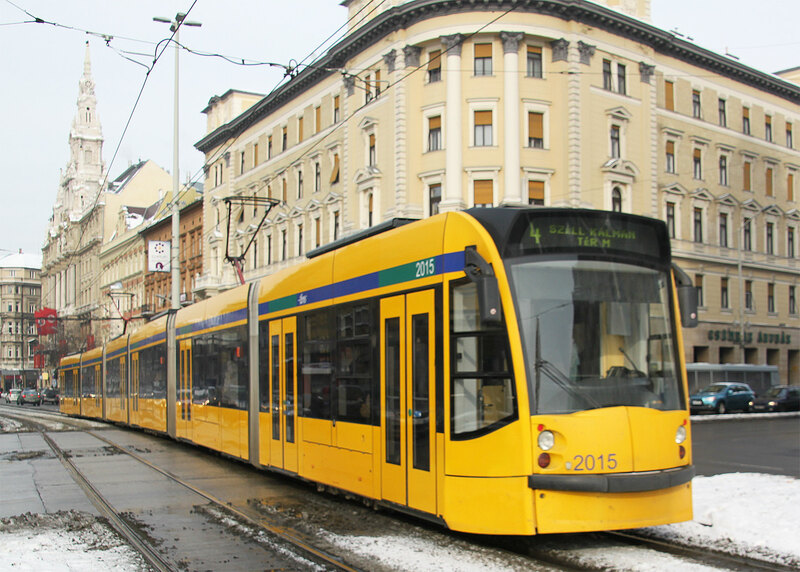 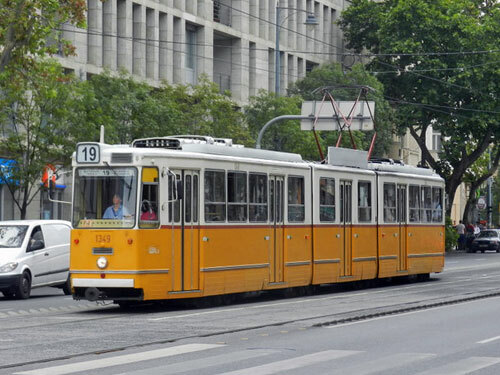 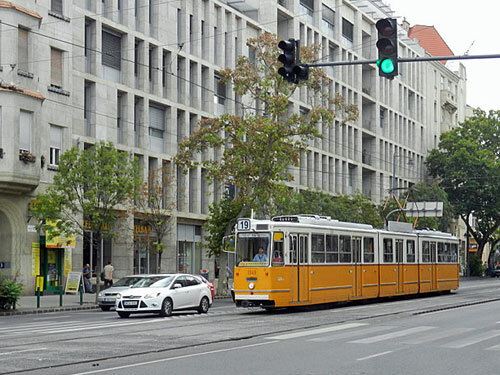 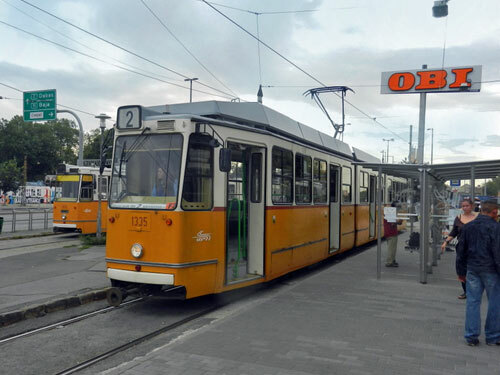 There is also a major project (currently under planning) to connect, extend, and develop the tram lines on the Buda side (providing longer lines and less transfers), which is currently held up by debate between the districts and the city. 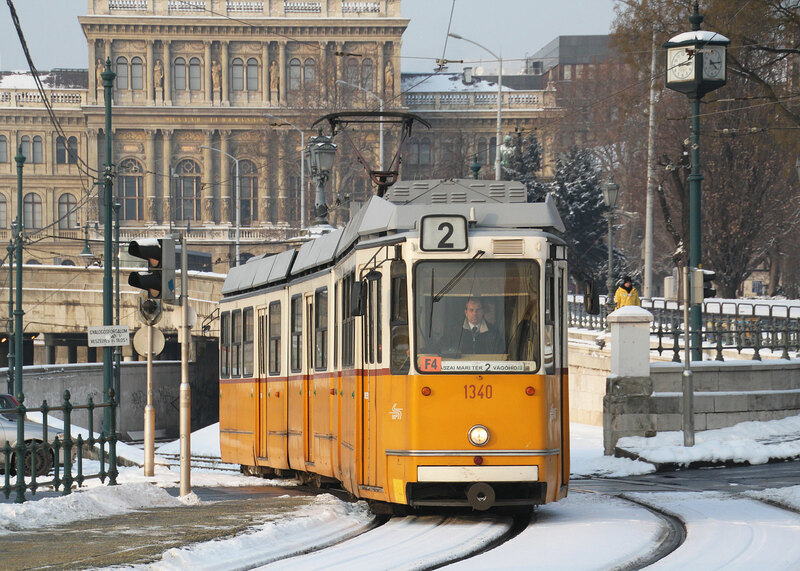 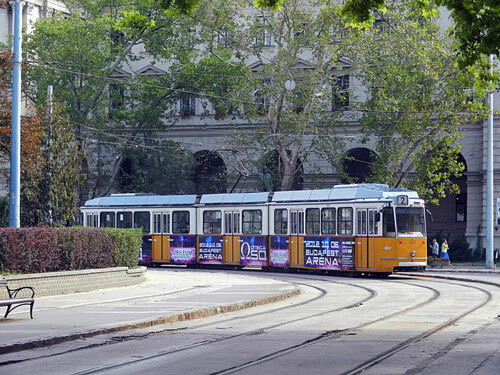 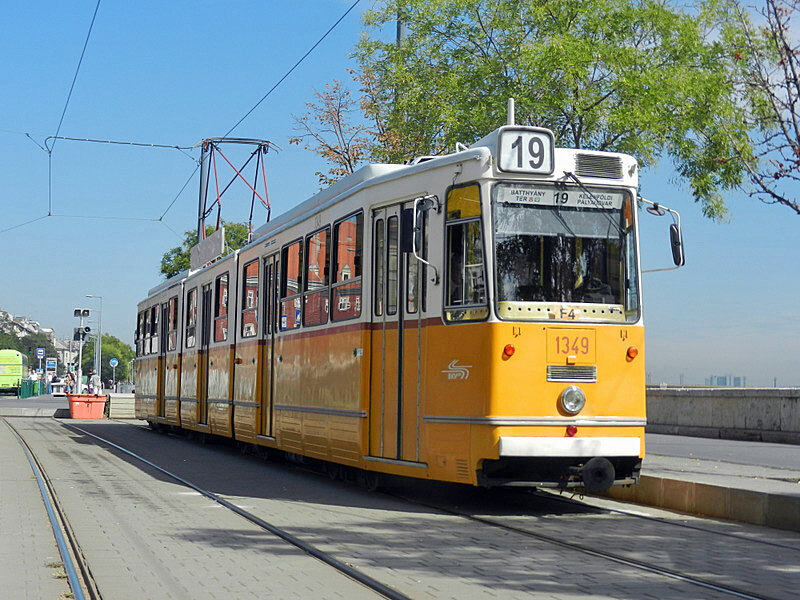 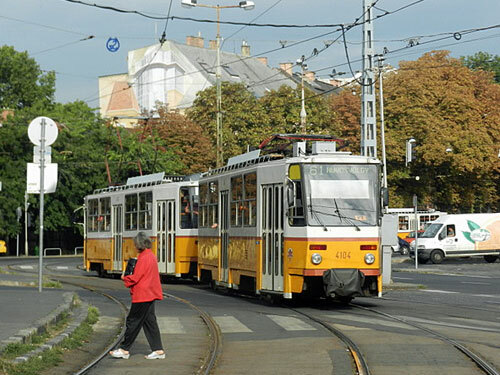 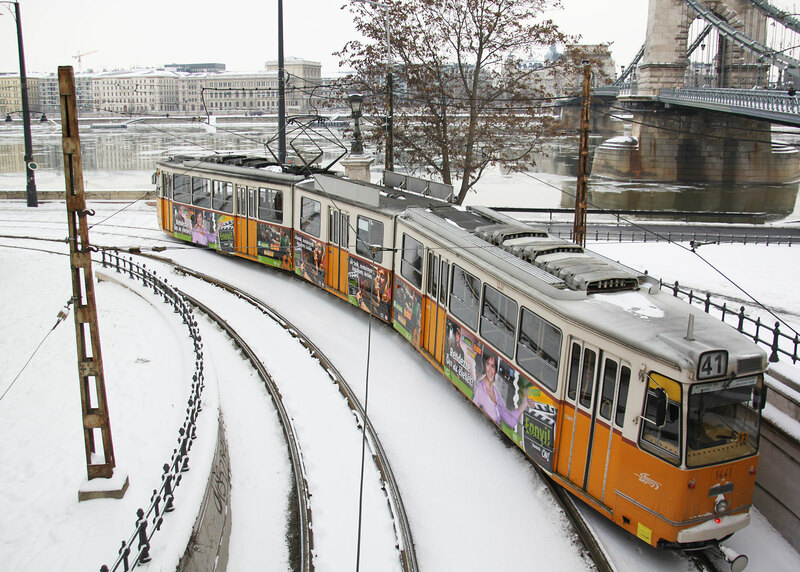 These Ganz articulated trams form the largest fleet on the Buda side of the Danube. 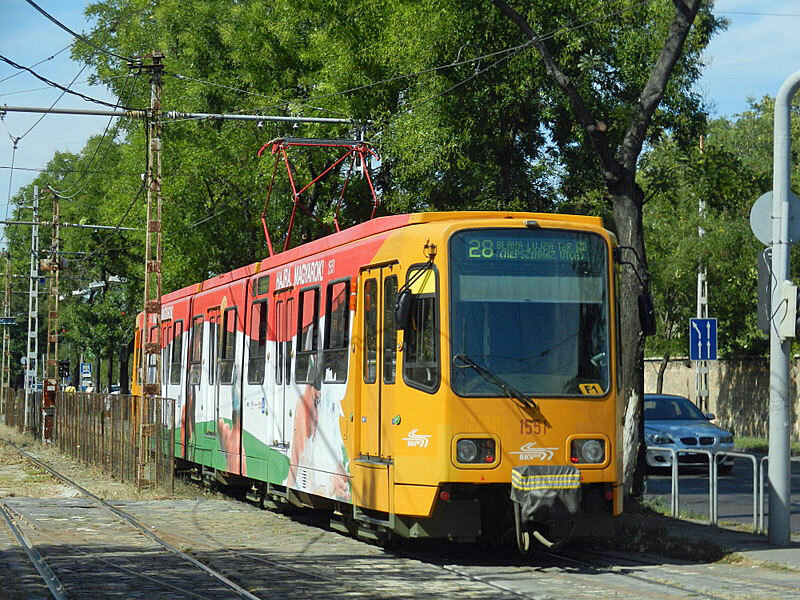 Around 150 units were built of which 30 have been updated and renamed KCSV7. Vehicles are in the 1300/1400 numbering series and they run on routes 2, 2A, 17, 19, 24, 41, 47, 49. 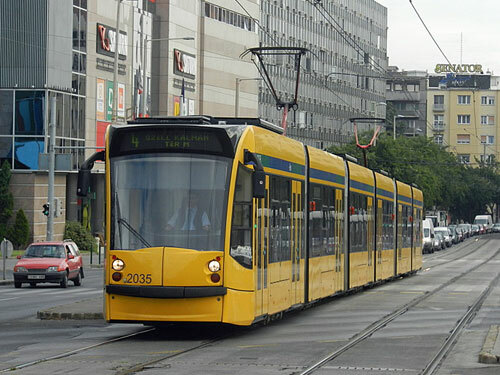 They also previously ran on routes 4 & 6 but have been replaced by new Combinos since 2007. 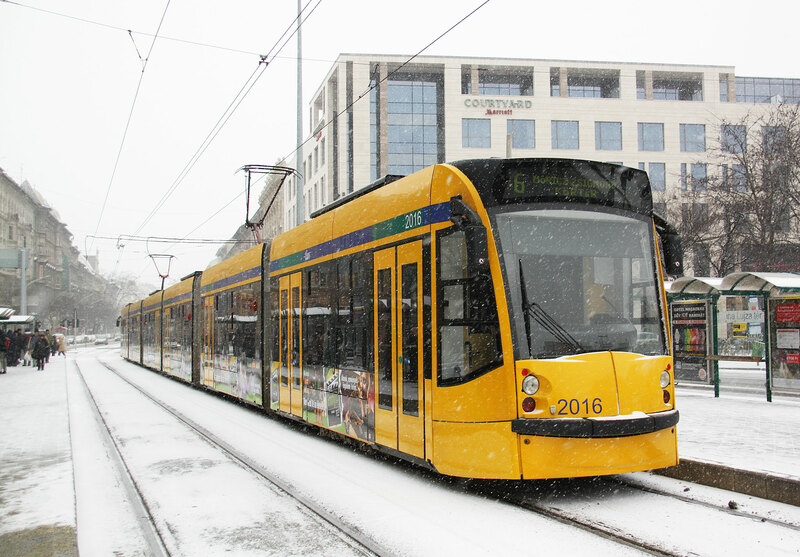 Thirty Ganz articulated trams have been updated and renamed KCSV7. Vehicles are in the 1300/1400 numbering series and they run on routes 2, 2A, 17, 19, 24, 41, 47, 49. 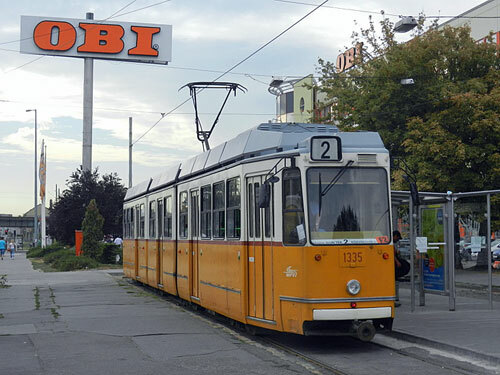 They also previously ran on routes 4 & 6 but have been replaced by new Combinos since 2007. 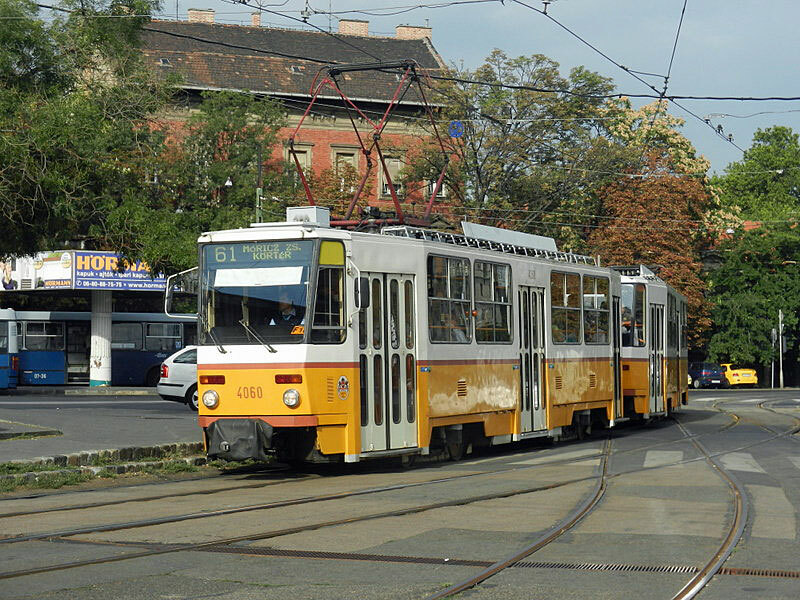 There are 320 T5C5 Tatra bogie trams in the fleet. 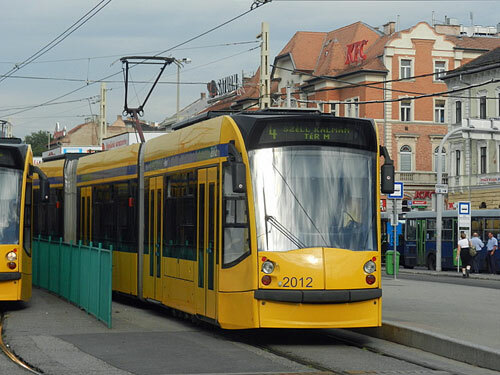 80 of which have modernised equipment and are re-designated T5C5K. They are run as both pairs and triple units. 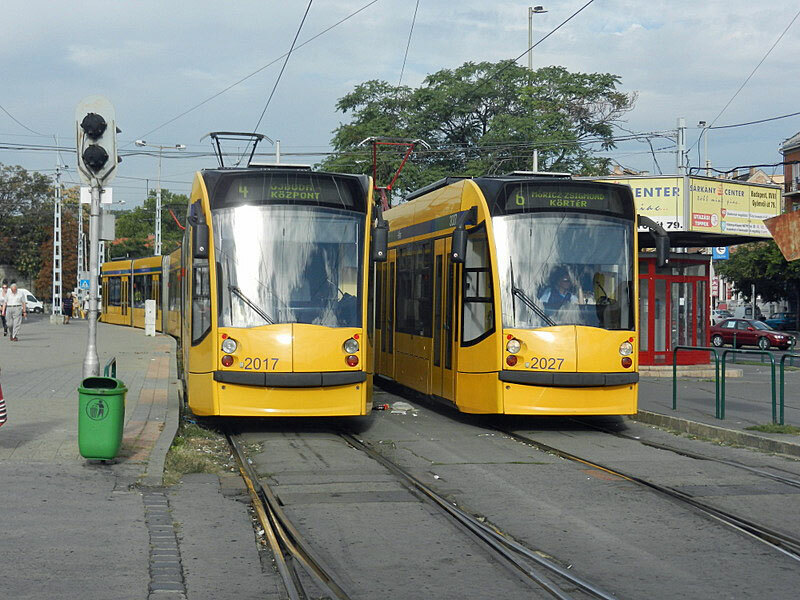 They are numbered in the 4000-4300s. 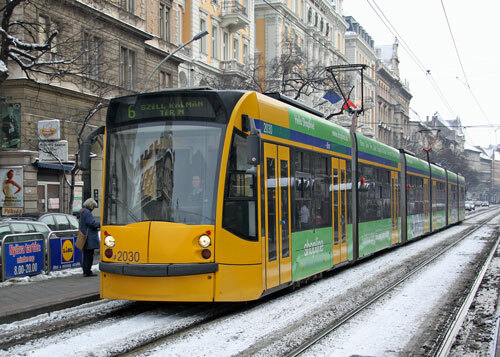 Newest trams in the Budapest fleet are 40 Siemens Combino trams used on routes 4 and 6, the busiest routes on the system. 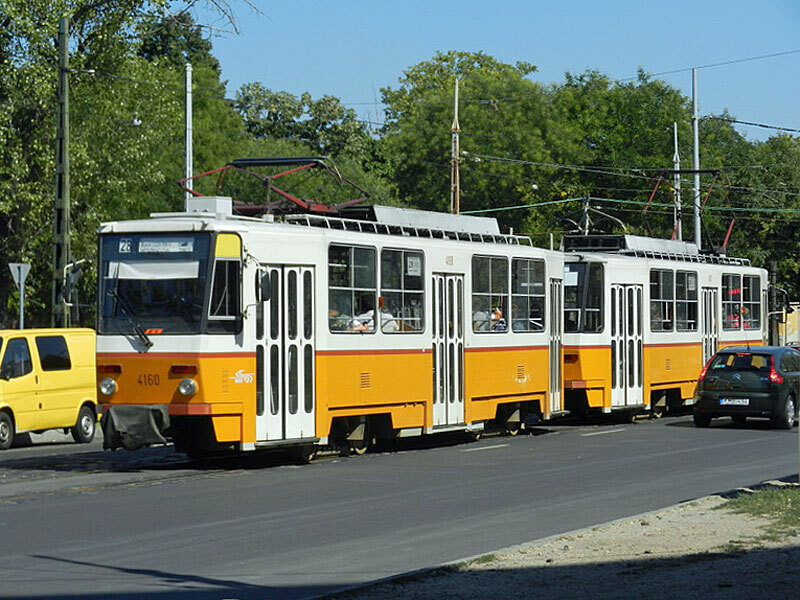 These trams have six sections and are 54m long, carrying 64 seated and 350 standing passengers (based on 4 per sq metre). 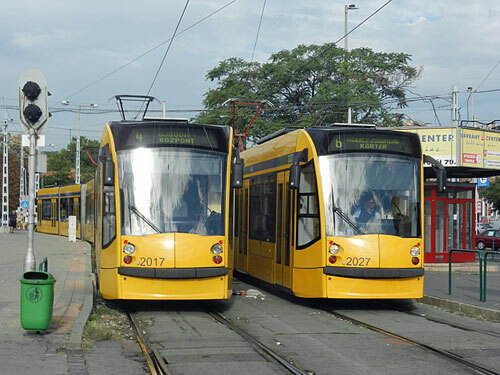 They are numbered in the 2000 series.